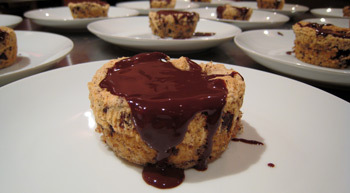 Join one of our hands-on cooking classes in the heart of NYC. Just click on any class on our calendar for the full menu and to sign up! For groups of 12 people or more, consider a private party. Celebrating a birthday , holiday, wedding, anniversary, graduation, or promotion? 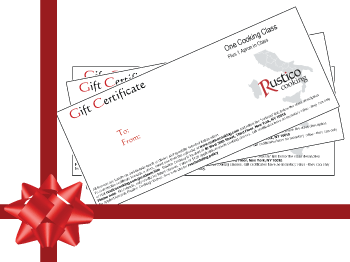 Whatever the occasion, give a gift certificate for a Rustico Cooking hands-on class in New York City. Your gift will be remembered long after the class is over! We’ll email you a printable copy within hours of your purchase. 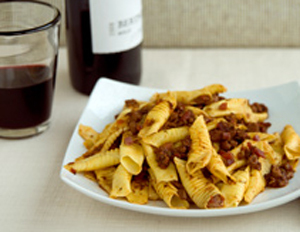 Complete the gift by adding a Rustico Cooking apron or The Best Pasta Sauces cookbook! Gift certificates value - $110 or $120? Ready to use your gift certificate? It's easy! Redeem it online by clicking Redeem your gift certificate at the bottom of each class description. A new window will open, allowing you to select the class and enter your information. We process the requests manually, usually within less than 24 hours of your request, and we'll send you a confirmation by email. We’re looking forward to cooking with you! Want to attend a class valued at $120, but you have a certificate valued at $110? Have a gift certificate valued at $120 but want two people to attend a class of $110? It's easy; just upgrade your gift certificate to make up the difference and you'll be all set! 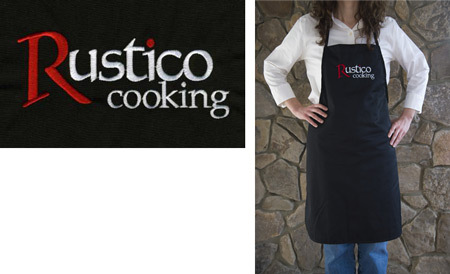 Add an apron to your gift certificate or cooking class purchase ... You or the lucky recipient will receive one of our Rustico Cooking aprons upon signing in at the class! Note that we do not ship the aprons. Micol's third cookbook "The Best Pasta Sauces: Favorite Regional Italian Recipes" is now out! 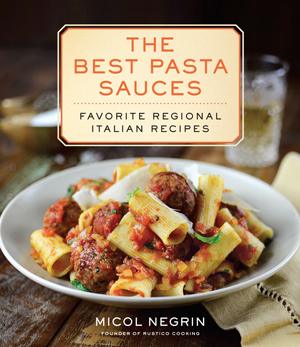 Published in October 2014 by Ballantine Books (a division of Random House), the 256-page book is filled with gorgeous color photography, 80 recipes for regional Italian pasta sauces, fool-proof techniques, and entertaining anecdotes... 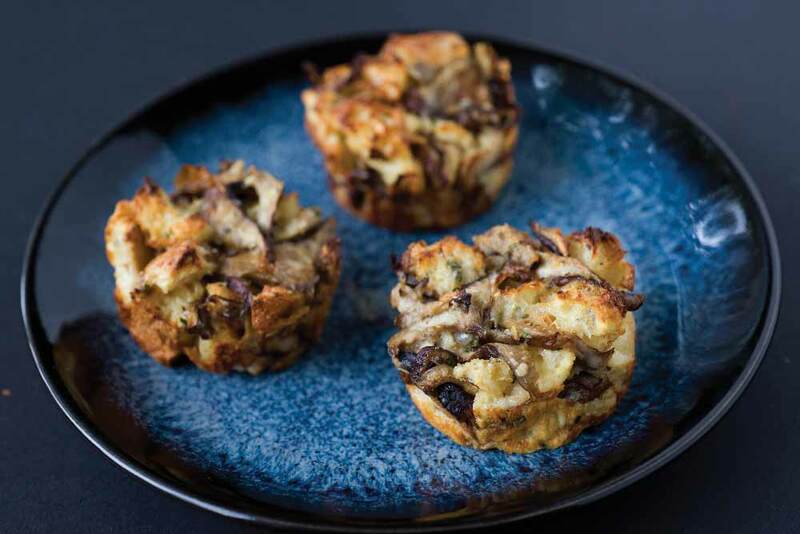 It is sure to become a favorite on your cookbook shelf. You can order copies from Amazon, Barnes & Noble or Indiebound, or you can purchase from us and get extra goodies! We are now offering shipping on the book and quantity discounts if you purchase 4 or more... Read on! You can also save on the book when bundling it with a gift certificate plus an apron, or a cooking class plus an apron. When purchasing a gift certificate or a cooking class, look at the options in the dropdown menu. FLASH SALE: $99 PER PERSON! 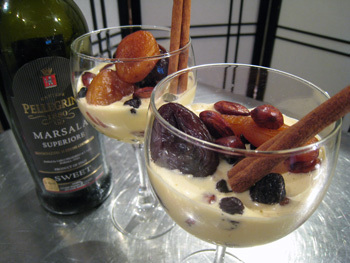 Cooking with wine is a common technique in Italy. 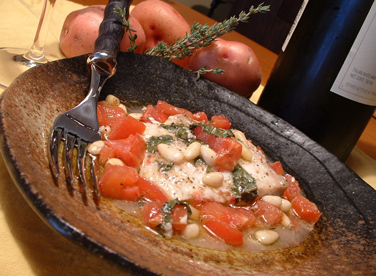 From pan sauces for pasta and meat to flavorful broths for cooking fish, wine is often the backbone of most Italian dishes. 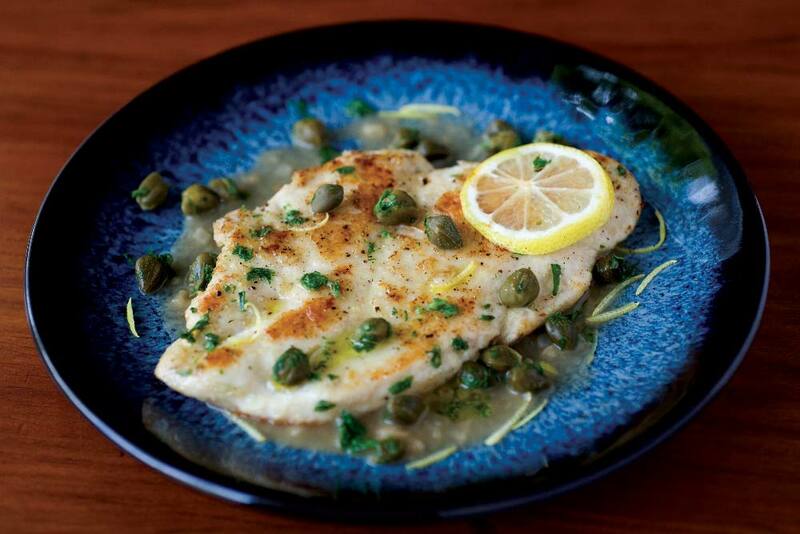 This menu features wine (white, red, dry, and sweet) in every dish. 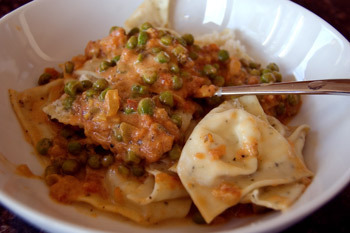 We'll prepare a succulent sauce for homemade cheese-filled ravioli using white wine, tomatoes, and cream, and stir in peas at the last moment for a pleasant sweetness and touch of spring. 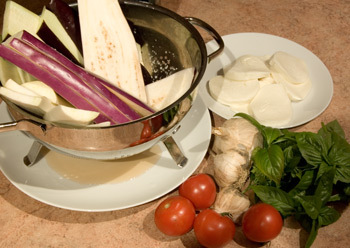 We'll make an intensely flavored Marsala wine reduction for chicken cutlets topped with crisp Prosciutto and oozing cheese, and roast vegetables with white wine until tender. 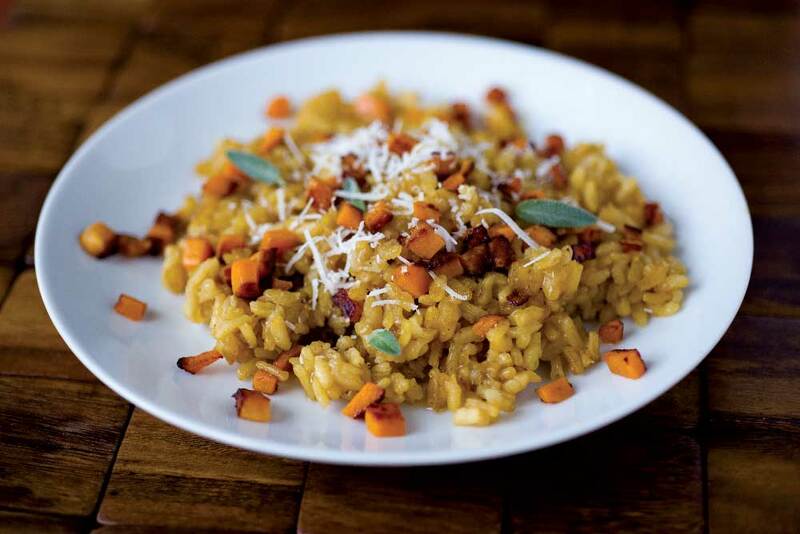 Prosecco will deglaze the pan for our butternut squash risotto, and we'll froth Marsala into a luscious cream with eggs and sugar as a topping for our wine-poached fruit. For a limited time, we are offering this class at a discounted price of $99 per person (regularly $110 per person). Join me for a brand new class devoted to the hearty country cuisine of Molise, a small, pristine region in the center of Italy just north of Puglia and across from the bay of Naples. 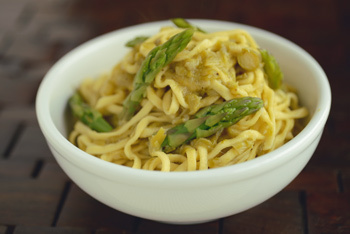 First up, an amazing pasta dish I enjoyed in the home of a Molisano winemaker: a heavenly mingling of rustic hand-made pasta strips with a sweet, silky asparagus puree that will have you thinking of asparagus in a whole new way. 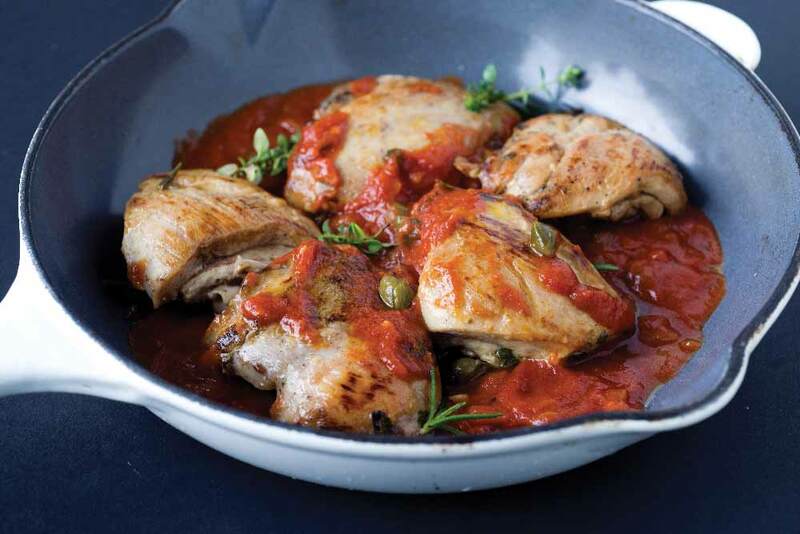 As a main course, we'll slow-cook morsels of boneless chicken with plenty of fresh herbs, olives, and onions until meltingly tender. 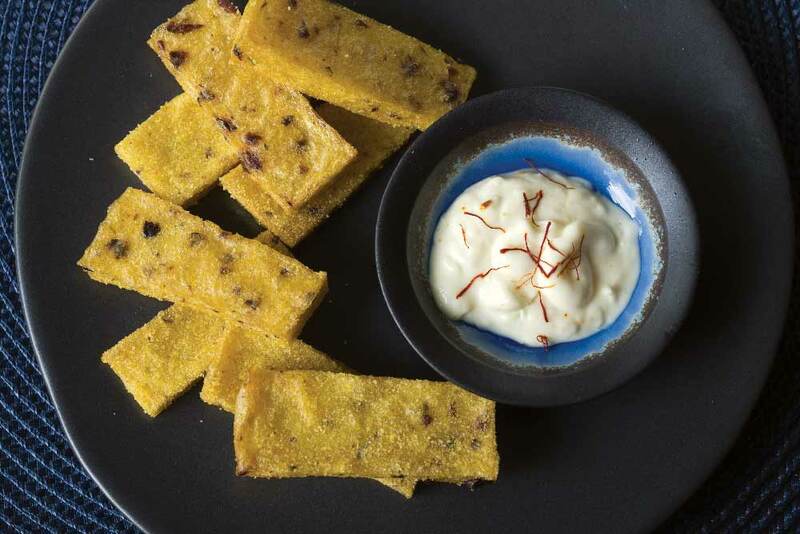 Our side dish is a colorful ode to eggplant: grilled slices of eggplant wrapped around a refreshing Ricotta and mint filling, topped with diced tomatoes and a splash of olive oil, served with a tantalizing crispy focaccia laced with fennel seeds and chili flakes. 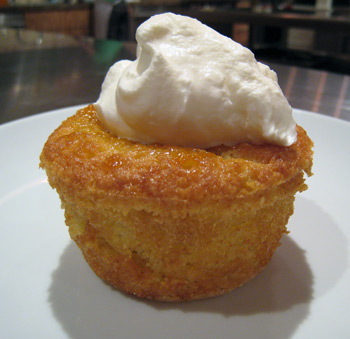 And for dessert, we'll bake a rustic orange and almond cake topped with a tuft of freshly whipped cream. From the Renaissance marvels of the Uffizi Gallery in Florence to the colorful costumes of the horse Palio in Siena and the splendors of its hilltop towns, Tuscany combines art, culture, architecture, and natural beauty in a seamless tapestry. 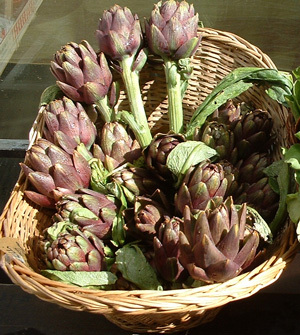 And there may be no better time to explore Tuscan cuisine than in the spring, when the markets offer a bounty of fruit and vegetables ready to be transformed into memorable meals. 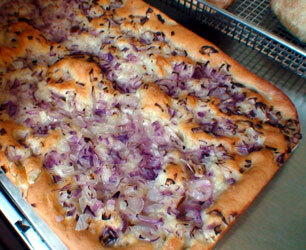 We'll learn to make Tuscany's focaccia, topping ours with caramelized onions, bacon, and a hint of Mascarpone cheese for a perfectly creamy texture. 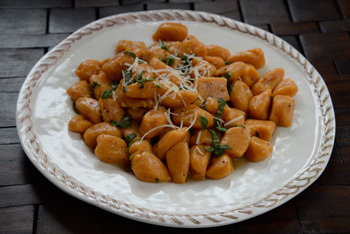 Next, we'll make delicate gnocchi sauced with tomatoes, sweet peas, and fresh herbs. 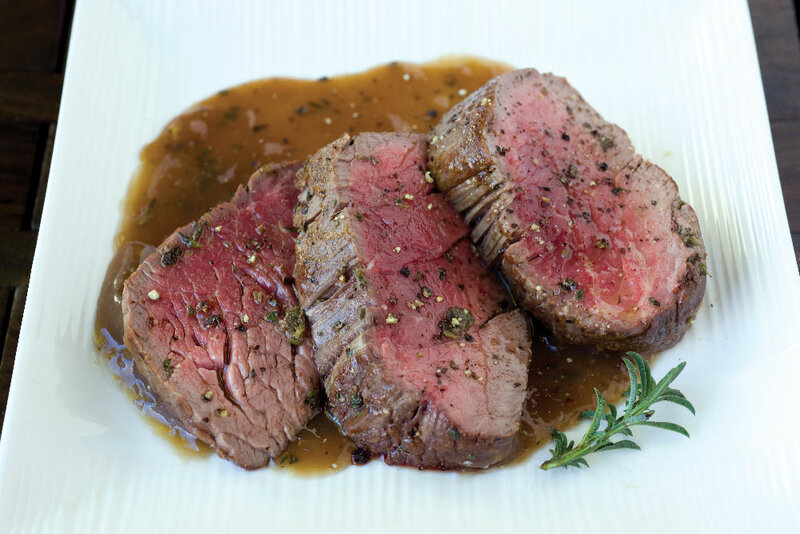 Tuscans are quite fond of beef, and we'll roast ours after marinating it with plenty of rosemary and garlic; the meat will emerge from the oven so succulent and rosy that it requires no sauce, but we'll prepare a classic salsa verde featuring fresh parsley, garlic, and olive oil to serve alongside. 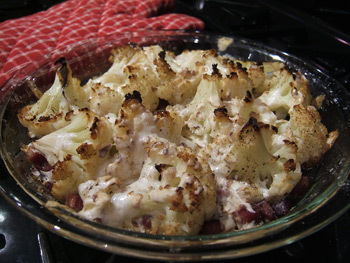 We'll slow-roast cauliflower, a technique that yields the most succulent florets imaginable. For dessert, we'll cook short grain rice with milk and sugar until tender, then bake it with pine nuts and citrus zest until it sets up into a creamy, luscious torte. In this new class, we'll recreate some traditional dishes from Trentino-Alto Adige, creating a true feast, northern Italian-style. 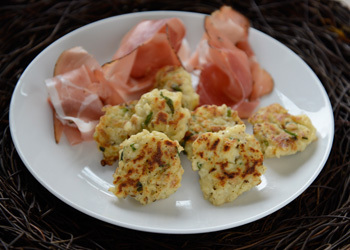 To begin, we'll make canederli, plump bread gnocchi flavored with chives and a smoked Prosciutto called Speck; you can serve these gnocchi in broth, or (the way we prefer them), panfried with sage and butter until they get crisp and golden on the outside. 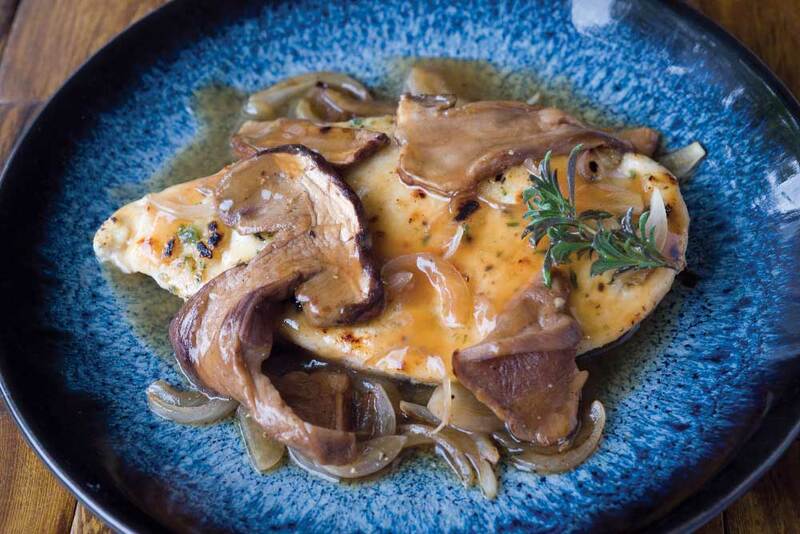 Next, we'll slow-cook herb-marinated chicken to perfection and make a succulent sauce for it using wild mushrooms, cream, and a splash of white wine. 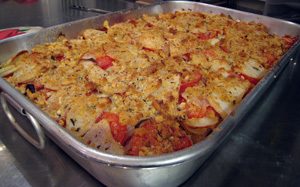 Roasted Brussels sprouts and a layered potato gratin with Pancetta, tomatoes, and onions make the perfect accompaniment to the chicken. And for dessert, what could be better than a delectable pear and chocolate tart, encased in a buttery sweet shortcrust dough of our making? 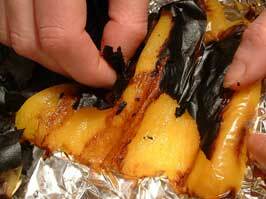 Join me for a brand new class on the essential techniques of Southern Italian cooking! 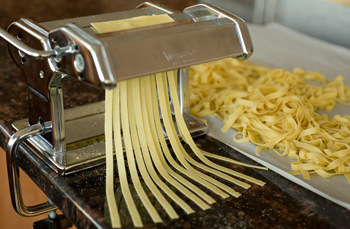 We'll teach you to make authentic homemade spaghetti using a curious stringed instrument known as chitarra; the trick is in the dough, of course, a recipe we've perfected over many years of cooking (once you've mastered this dough, you'll be able to make any type of short or long or filled pasta... you'll be amazed at how versatile this recipe is). 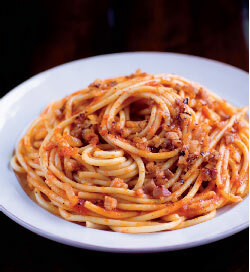 We'll sauce our spaghetti alla chitarra with a hearty southern Italian ragu. 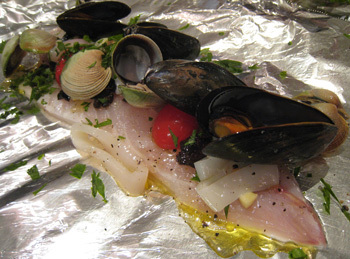 As a main course, we'll cook branzino filets in foil packets with mussels, cockles, tomatoes, and herbs, a technique known as al cartoccio in Italian that yields amazingly succulent results. 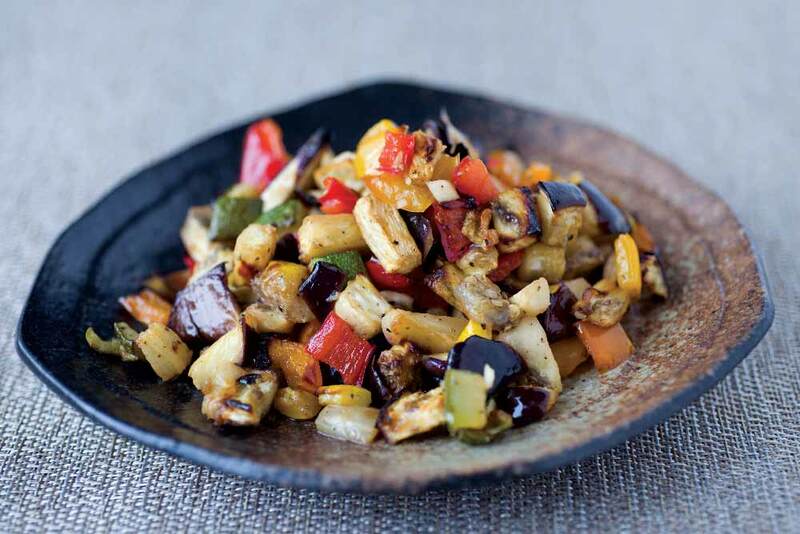 We'll make the most addictive eggplant caponata imaginable, typical of Sicily with its sweet and sour notes of raisins and vinegar. 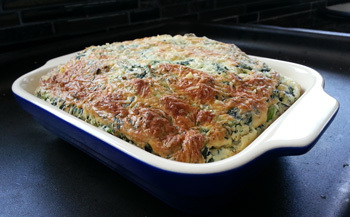 A savory broccoli raab bread pudding rounds out the meal. 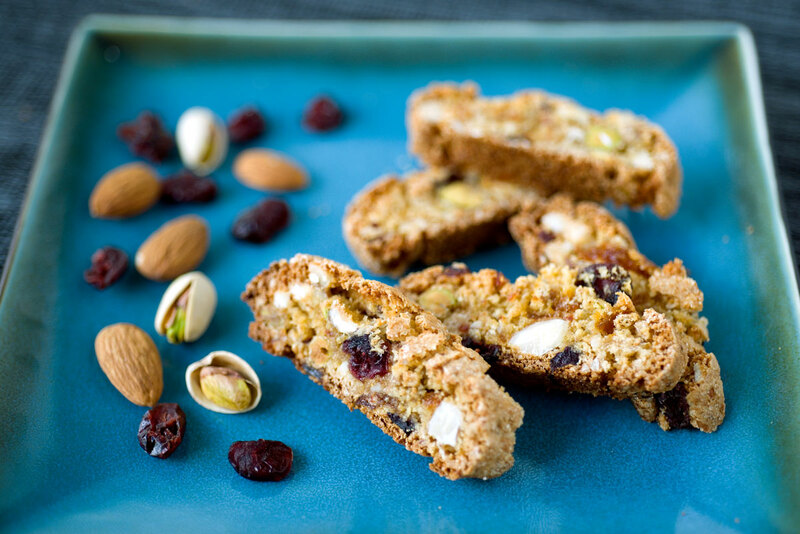 And for dessert, we'll make crunchy, fig and walnut biscotti that will have you sneaking back to the kitchen for more. Even expert cooks will learn plenty in this new class, as the menu covers many of the basics of Southern Italian cuisine... and of course, after the cooking is done, we'll sit down to enjoy our southern Italian feast with specially selected wines. 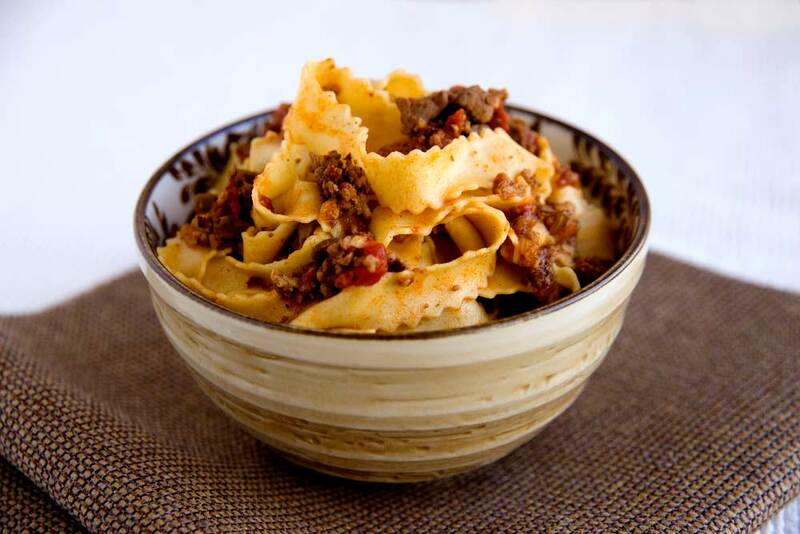 This brand new class on northern Italian cuisine starts off with one of Italy's most beloved pastas: an elegant lasagna bolognese, prepared with handmade spinach pasta, layered with creamy bechamel and a sumptuous, slow-cooked ragu; once you've mastered the way to knead and roll out fresh pasta dough for lasagna, you'll be able to make all manner of fresh pasta from scratch at home. 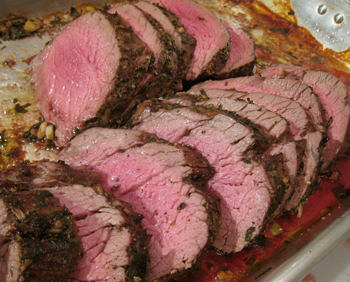 We'll roast an herb-rubbed beef tenderloin (aka filet mignon) until it is perfectly rosy, and serve it in hearty slices with a bracing caper-and-parsley sauce known as salsa verde in Italy; this recipe will not only demistify the cooking of filet mignon, it underscores the fact that a delicious, versatile sauce need not be difficult to make. We'll roast asparagus with Parmigiano, and sweet peppers with Pancetta and Pecorino, as a colorful side to our filet mignon. And for dessert, I'll share my mom's recipe for a flourless, light-as-air almond-chocolate cake napped with a thick layer of chocolate ganache... what a way to end our northern Italian feast! Best known around the world for its pizza and pasta, Southern Italy's exuberant cuisine relies on sun-kissed vegetables and herbs, dried pasta, and fresh farmhouse cheeses (chief among them water buffalo's Mozzarella). 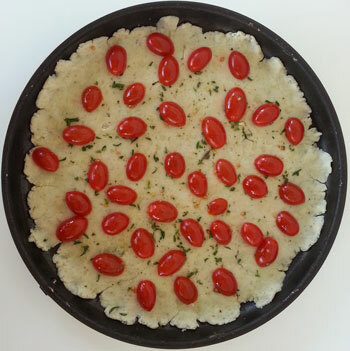 We'll begin our southern Italian feast with a timeless classic: handmade potato "pizza" topped fresh tomatoes, Mozzarella, and oregano, the perfect starting point for any Italian meal. 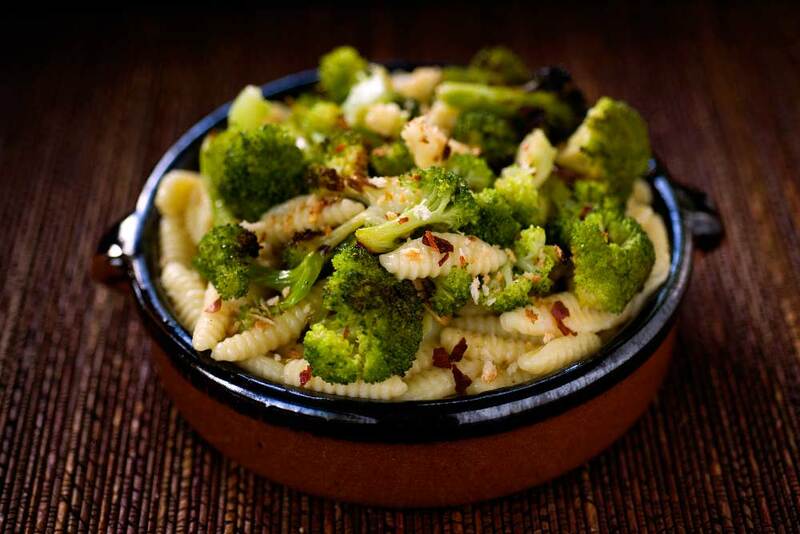 Next up: handmade cavatelli pasta tossed with garlicky broccoli and toasted bread crumbs, a vibrant dish you'll crave again and again. 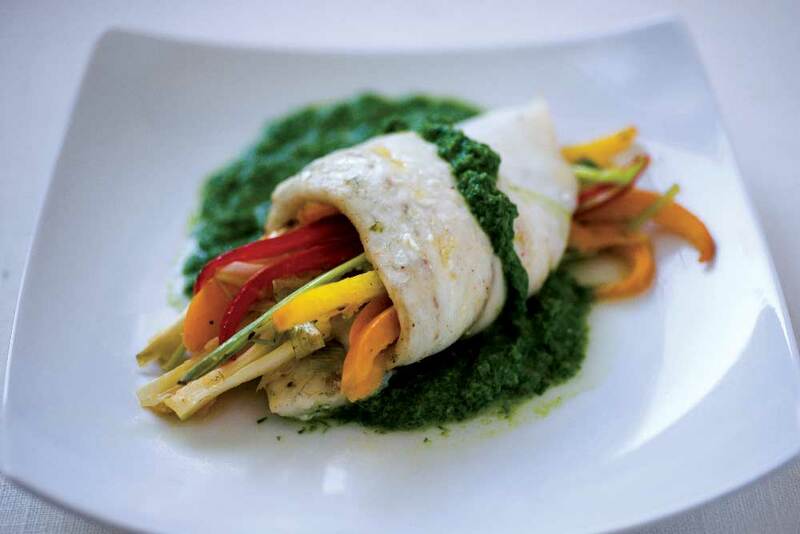 Our main course: wine-poached sea bass with fresh tomatoes and herbs, served with a side of roasted peppers. 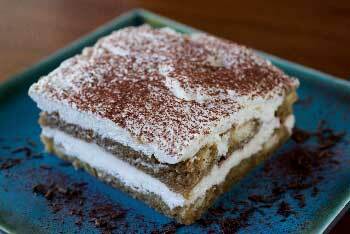 A classic Neapolitan dessert featuring liqueur-soaked ladyfingers and a silky espresso custard closes the meal on a decadent sweet note. I was born in Milan, so I often make my way over there, and whenever I do, I try to discover a new restaurant and taste the local cuisine. 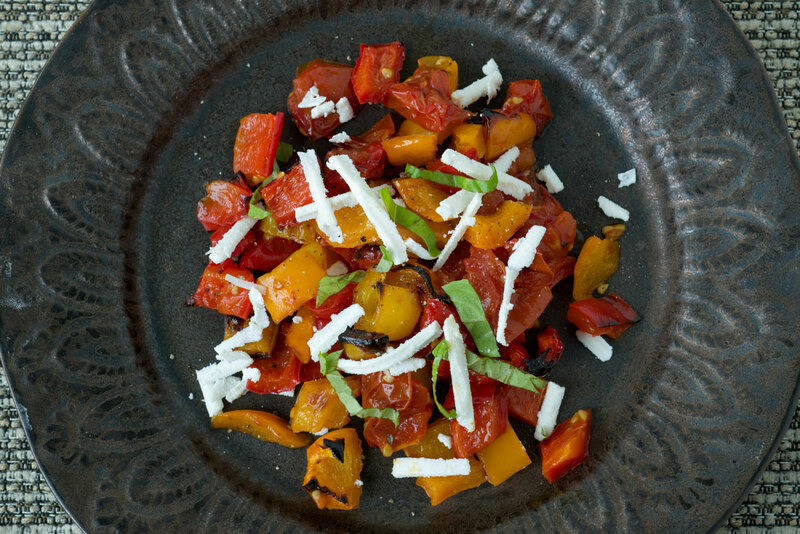 A savory interplay of butter, cow's milk cheeses, rice, polenta, fresh pasta, veal, beef, and pork, and humble vegetables and beans, Milanese cooking is robust, perfumed, and just right for a summer feast. 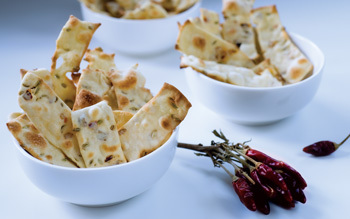 We'll start our feast with homemade focaccia topped with caramelized onions; once you've mastered the focaccia dough, you'll find yourself using the recipe for bread, pizza, focaccia, even breadsticks, it's that versatile and foolproof. 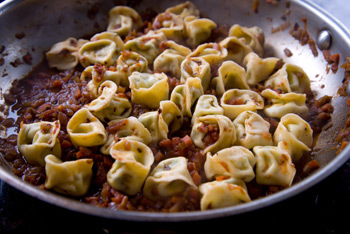 Next up, tortellini stuffed with sweet sausage and Parmigiano, sauced with a robust tomato sauce spiked with red wine. 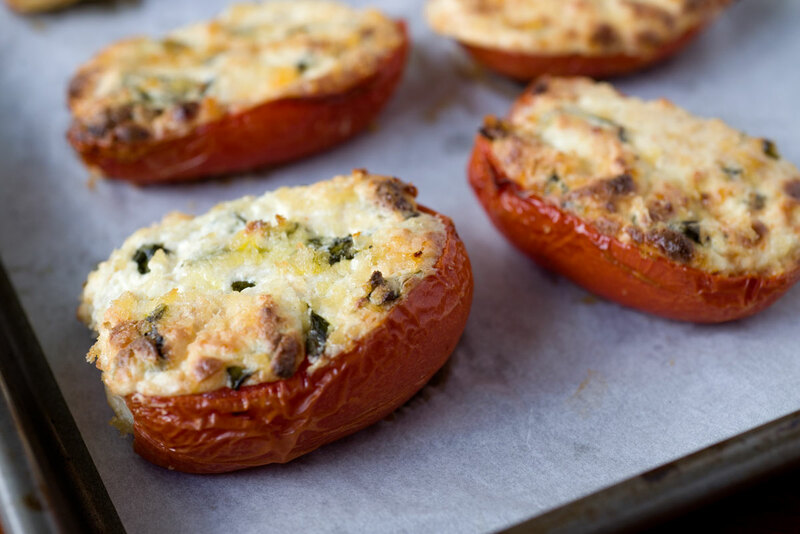 We'll prepare a luscious main course of tender chicken cutlets, browned in olive oil and sauced with a balsamic glaze reduction; a savory side of roasted plum tomatoes stuffed with cheese and herbs rounds out the meal. 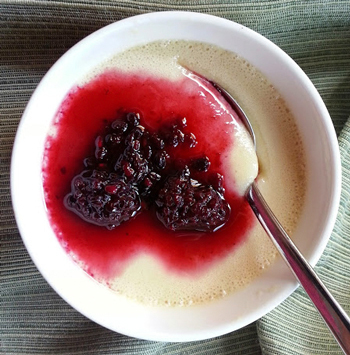 And for dessert, we'll make the lightest, creamiest panna cotta ever, hauntingly flavored with amaretto cookies for a taste and texture that is truly spectacular. 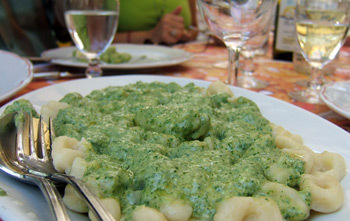 This is your chance to learn to make three different (and very delicious) regional Italian pastas: light-as-a-feather Ricotta gnocchi from Tuscany, sauced with the most fragrant arugula pesto imaginable; cheese-and-basil-filled ravioli tossed with a delicate herb-infused butter, a specialty of Liguria; and rustic homemade cavatelli from Basilicata, tossed with sausage and broccoli raab, so delicious dusted with Pecorino Romano. 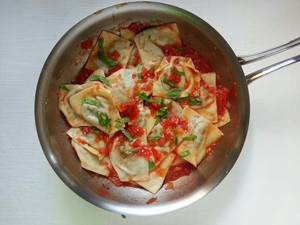 You'll not only learn to make, roll out, and shape the dough for these three very different pastas, you'll participate in preparing the sauce for each so you can recreate these three delectable first courses at home for family and friends. 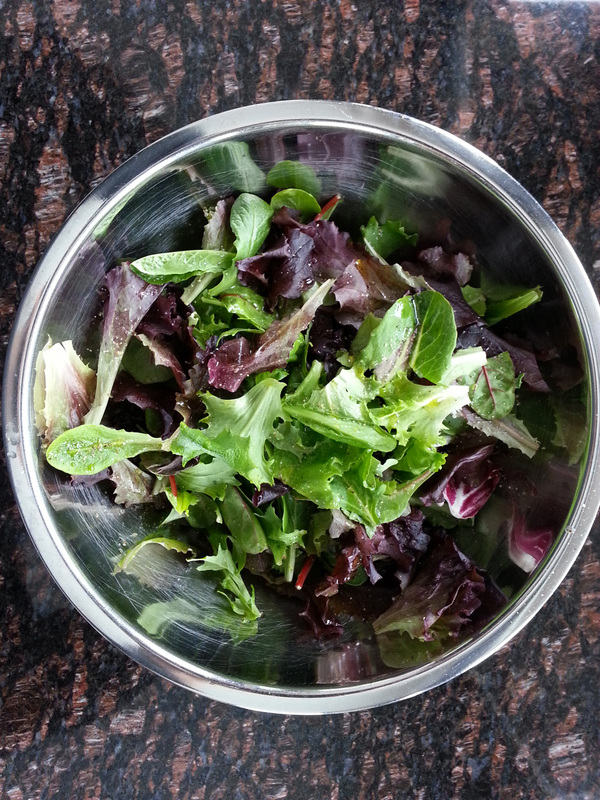 After the cooking is done, we'll sit for a pasta-lover's feast, accompanied by three fabulous wines and a refreshing green salad to cleanse the palate. 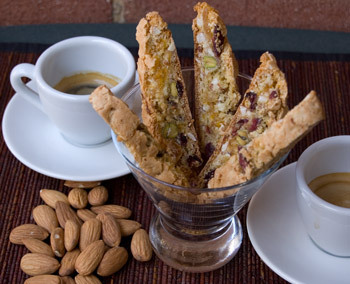 And since no meal is really complete without dessert, we'll indulge in crunchy almond biscotti and some freshly brewed espresso. 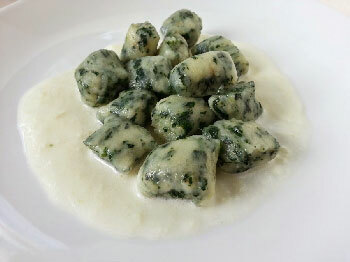 In this brand new class devoted to the cooking of Venice, we'll learn to make five fabulous dishes... We'll begin our Venetian menu with a deeply flavored homemade pasta: light, pillowy spinach and potato gnocchi served with the most delectable Gorgonzola cream sauce imaginable. Slow-cooking chicken with brandy and aromatic herbs yields succulent results; adding porcini mushrooms elevates this delectable main course to new heights. A creamy side of roasted fennel and slow-cooked, cheese-laced polenta is a lovely counterpoint to the chicken's rich flavors, and an elegant dessert flavored with chocolate and Amaretto tops off our Venetian feast in high style. 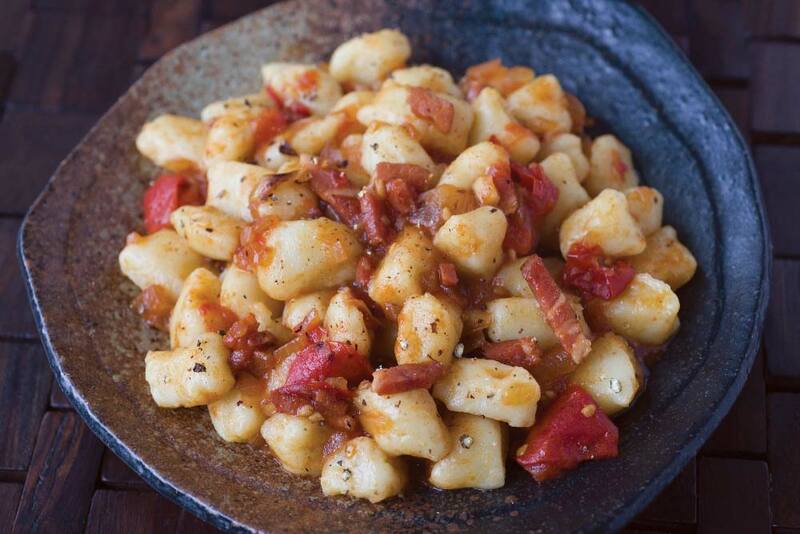 This cooking class is all about the pleasures of rustic cuisine, and features an all-star line-up of five rustic dishes from all across Italy. 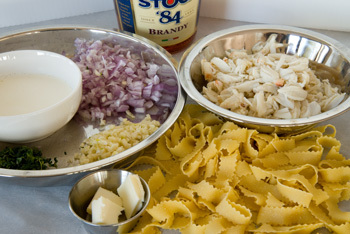 First up: a luscious plate of handmade tagliatelle, tossed with seafood cooked in white wine and tomatoes. 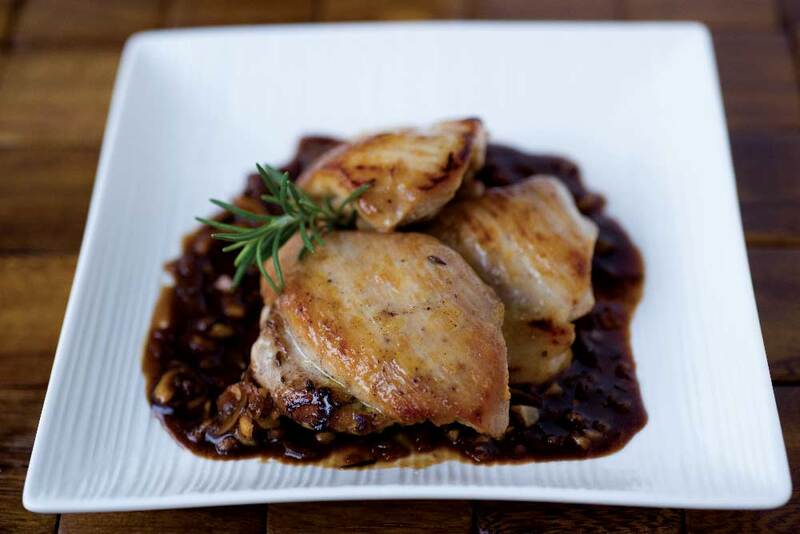 Our main course: tender chicken cooked to perfection with a honey-laced balsamic sauce, quite lovely served with garlicky string beans and basil-kissed risotto. 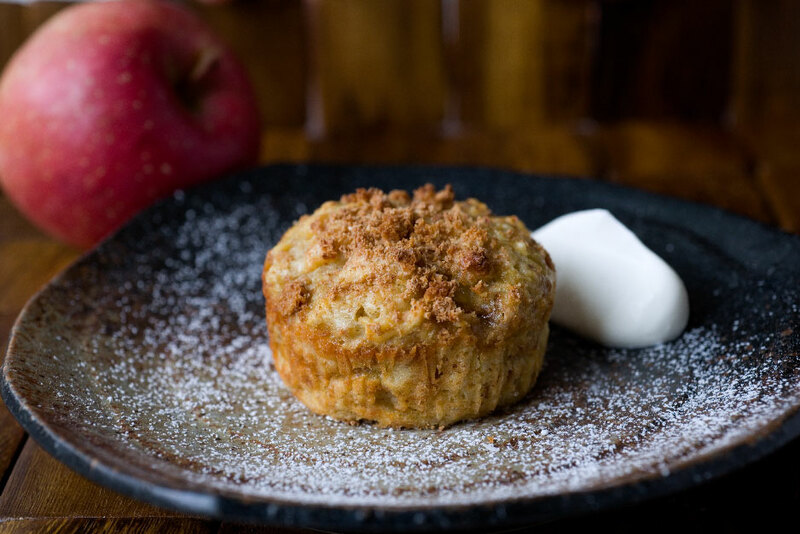 For dessert, we'll fill rounds of rich, buttery puff pastry with apples, almond paste, and brown sugar... what a heavenly combination! Why should entertaining be stressful? 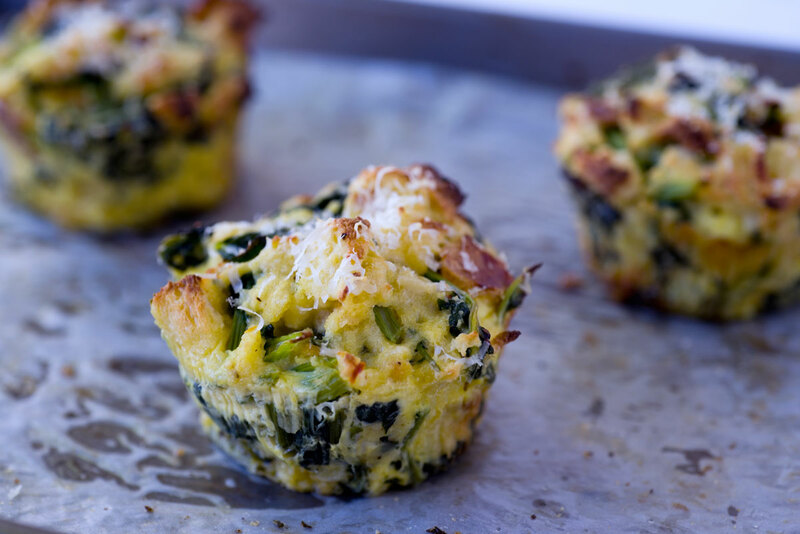 This menu is filled with one "wow" dish after another, but can be put together easily, and for the most part, well ahead of time, so you can enjoy your guests' company instead of fretting in the kitchen. 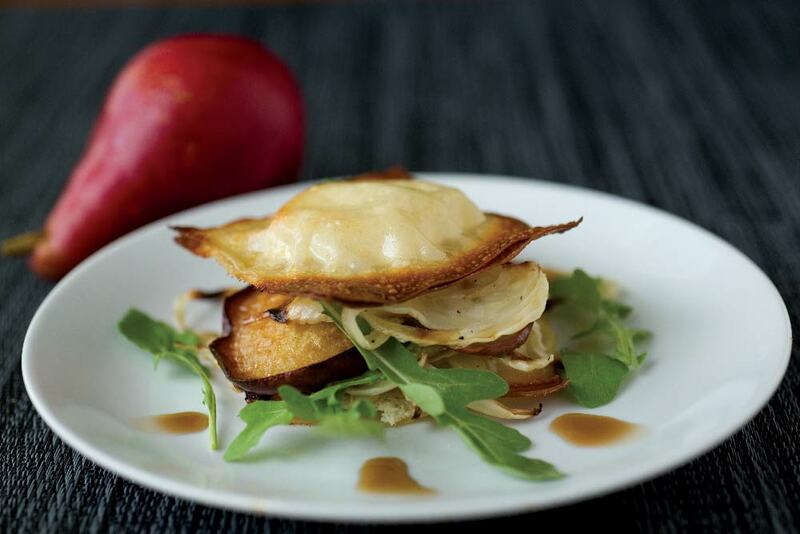 You'll learn to make crispy, golden ravioli filled with creamy goat cheese and fresh herbs, served stacked with caramelized fennel and pear wedges, peppery arugula, and a slightly sweet balsamic glaze. Our main course: rosy filet mignon in a rich red wine sauce, so elegant with a side of roasted broccoli and light, pillowy gnocchi in sage butter. And for dessert, nothing beats a flourless chocolate cake, especially when hazelnut flour and rum are folded into the batter. 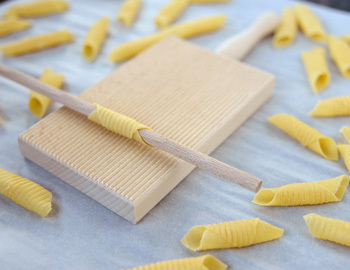 This class was designed for anyone who wants to perfect the art of making fresh pasta from scratch. 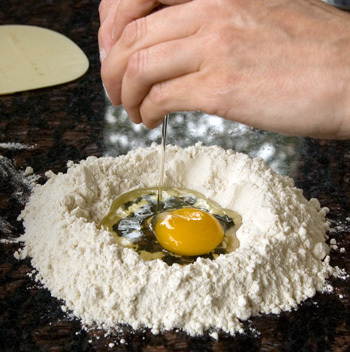 You'll begin by kneading your very own egg pasta (the ratio is simple and foolproof), working alongside your class companions as you master the timeless techniques of incorporating egg into flour and working the dough into a supple and silky mass with your hands. 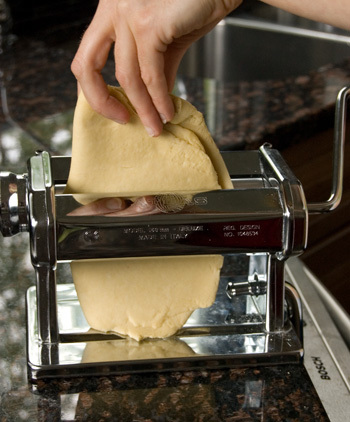 After the dough rests, we'll roll it out into thin lasagna sheets and finish it two ways: cutting it with the aid of a pasta machine, into picture-perfect tagliatelle; ; and stuffing it with a luscious three-cheese filling, yielding delicate ravioli worthy of elegant entertaining. 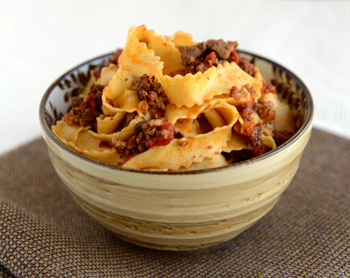 We'll also learn to prepare two classic sauces of the Italian kitchen: a light, herb-laced tomato sauce, and a delicate ragu slow-cooked with plenty of herbs and wine. 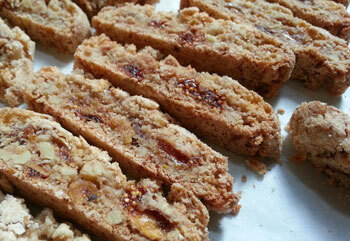 We'll also learn to make crunchy, addictive almond biscotti. And after the cooking is done, we'll savor our fresh pasta paired with our homemade sauces, followed by a light green salad and our just-baked biscotti. 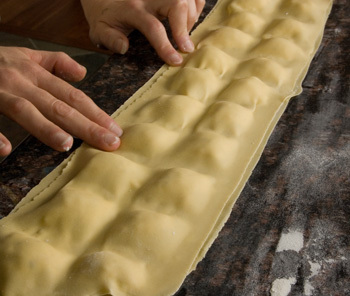 The techniques you'll learn in this class will serve you whenever you make any type of pasta: long or short, flat or filled, from lasagne and ravioli to pappardelle and tagliatelle. Don't wait too long to sign up for this class; it's sure to sell out quickly! 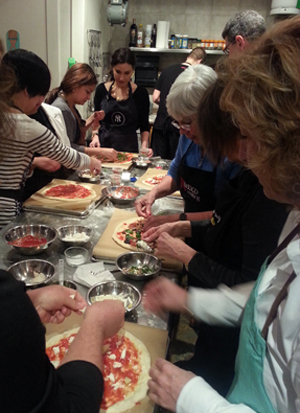 Click the image below to see a short video taken during one of our Rustico Cooking pizza classes! BONUS: Free pizza dough to take home after class!! I've been teaching Italian cooking for years, and the thing that seems to scare people off more than anything is working with yeast. 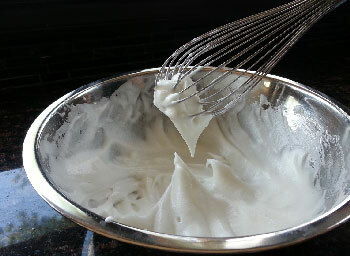 Maybe it's the fear that, left to its own devices, yeast will take over the kitchen--just think of dough ballooning out of the oven in that episode of "I Love Lucy". But I've found that once people get their hands into the dough and get familiar with how yeast works, the fear disappears. 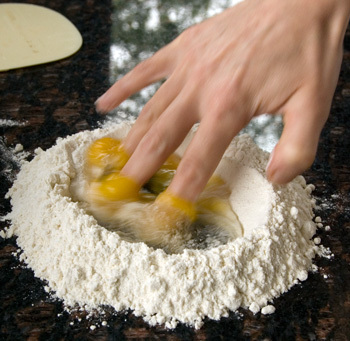 All it takes is understanding a few rules, getting comfortable with basic techniques such as kneading and shaping the dough, and a reliable recipe. 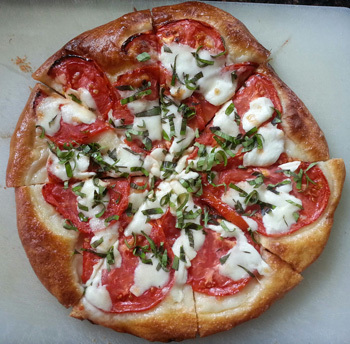 Whether you're making bread, focaccia, pizza, or any other yeast-risen dough, the principles are the same. It's all about temperature, ingredients, and technique. 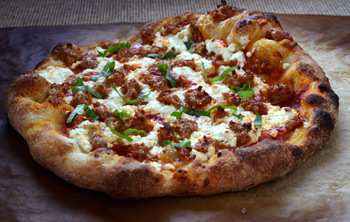 If you've ever wanted to bake crisp, thin-crust pizzas, this hands-on class is for you: I'll take you through the essential techniques of kneading, rolling, topping, and baking pizza dough and demystify the process of working with yeast. 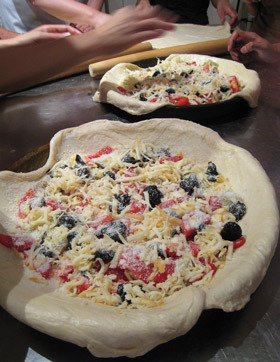 We'll bake Italy's most famous pizzas, starting with the classic tomato- and Mozzarella-topped Pizza Margherita, then set our imaginations free and combine various toppings for a true pizza-lover's fantasy. 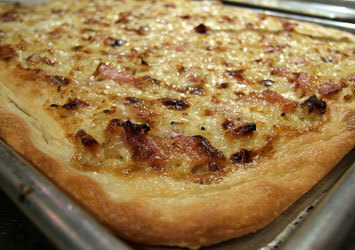 We'll even make a sweet pizza... delicious with a glass of sweet wine at meal's end! I was born in Milan and lived there until I was nine, and while some people will tell you that Milan is best known for its fashion than its cuisine, the cooking of my native city is a delicious one that deserves to be discovered. 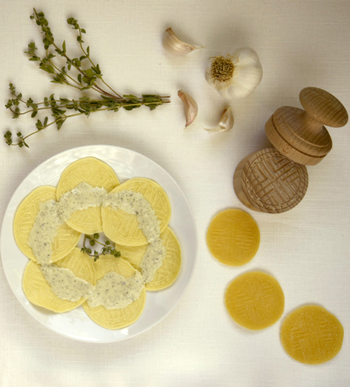 This class features some classic Milanese dishes, starting with a delicate cheese-filled pasta in sage butter. 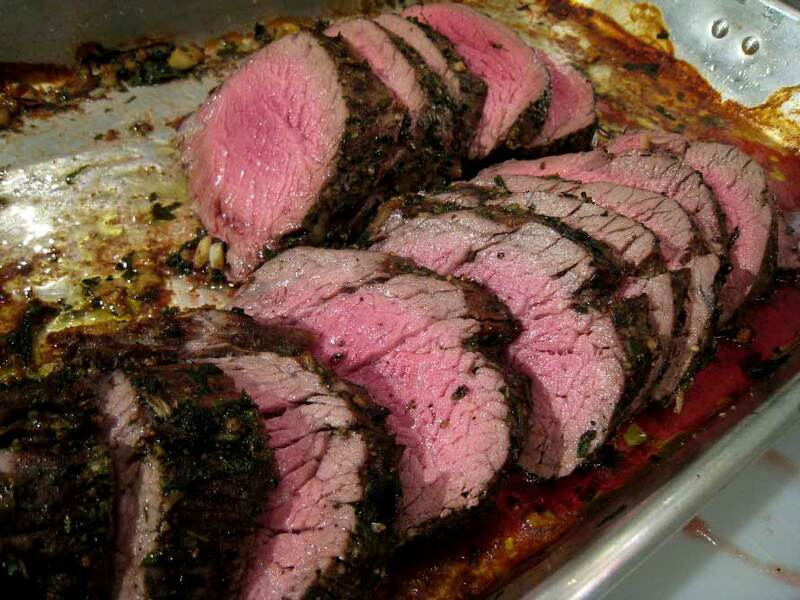 Next, we'll enjoy a perfectly roasted filet mignon accompanied by an elegant red wine sauce, my mom's roasted asparagus, and the most heavenly risotto with basil pesto. 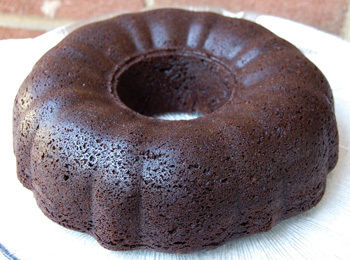 For dessert, we'll indulge in my Nonna Eva's moist, light chocolate cake, a staple on our family table since the 1940s, when my father, as a young boy, devoured a cake each afternoon with his two brothers upon returning from school. 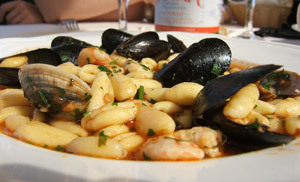 The Italian seaside: lush visions of blue waters, gentle breezes, golden sun... Take a virtual journey to the Italian seaside with me in this new class devoted to the pleasures of Italian seafood cooking. 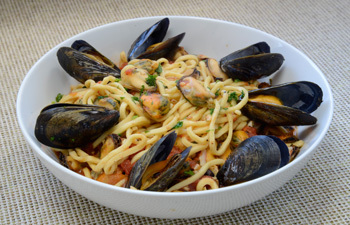 We'll start off with a southern Italian take on pasta with seafood, featuring handmade cavatelli with shrimp and mussels in a light tomato and white wine sauce. 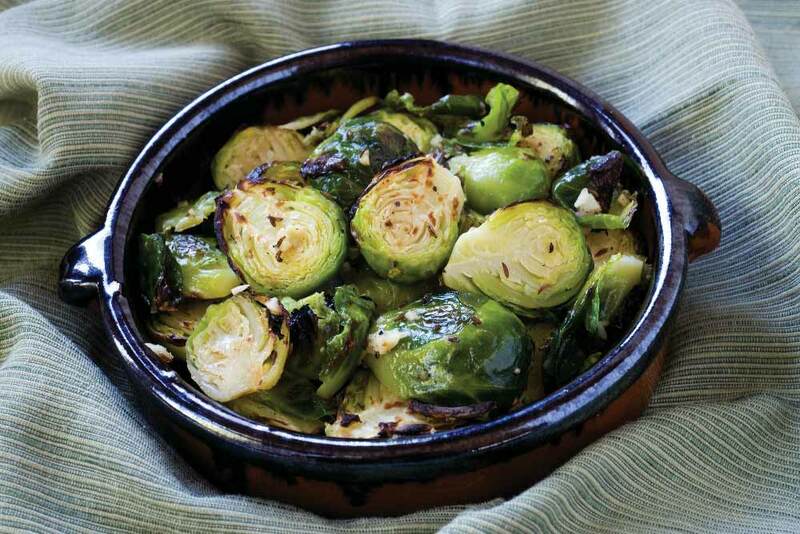 We'll roll delicate fillets of branzino around sweet peppers and roast them in an elegant white wine broth, and serve a heavenly shrimp and asparagus risotto, and caramelized Brussels sprouts, alongside. 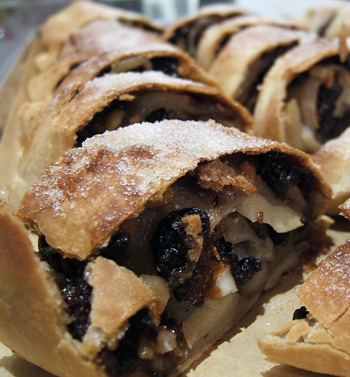 We'll finish our seaside feast with a flaky apple and nut strudel garnished with a hearty scoop of vanilla ice cream; the dough for this strudel is made with extra-virgin olive oil rather than butter, and it bakes up flaky and light, the ideal complement to the sumptuous nut and fruit filling inside. 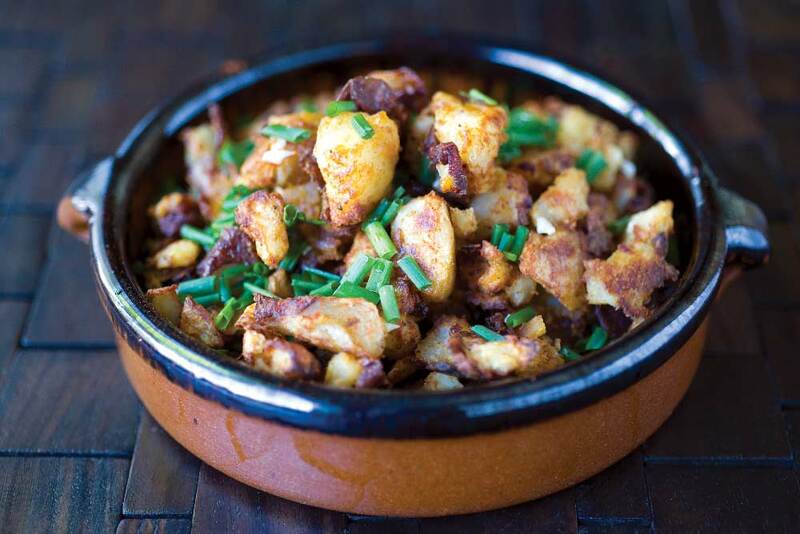 Home cooking is often the best cooking of all: tasty, satisfying, never pretentious, it delivers great flavor and a comforting sense of being taken care of. 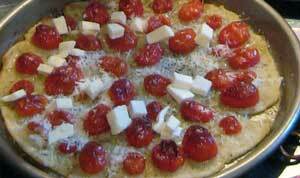 In Italy, home cooking varies from region to region, town to town, cook to cook. 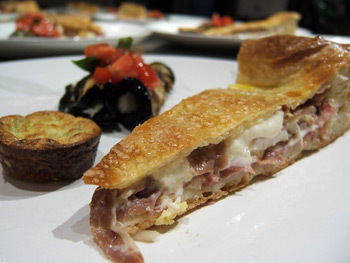 This class features five typical home-cooked dishes from Tuscany, Lombardy, and Piedmont, ideal for summer entertaining: and best of all, most of the preparation can be done entirely ahead of time, leaving you free to relax with your guests over a glass of wine. 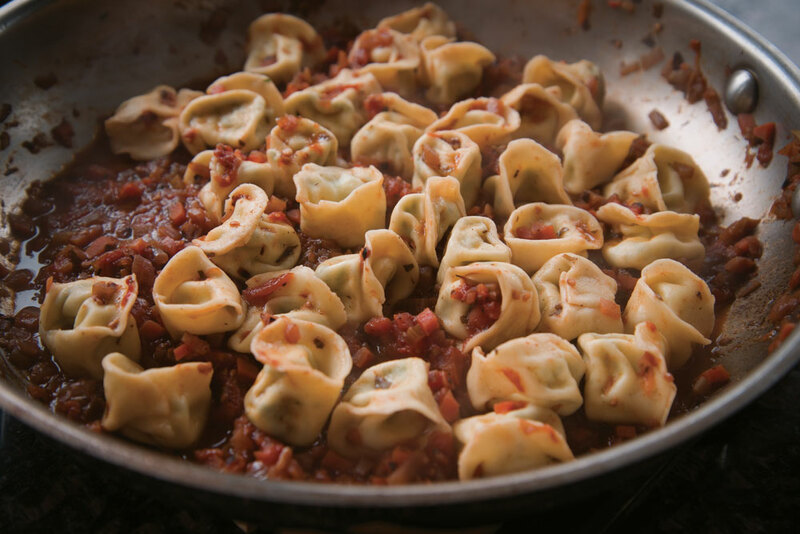 We'll begin by making fresh cheese tortellini, a Tuscan specialty, in a hearty red wine-laced tomato sauce. 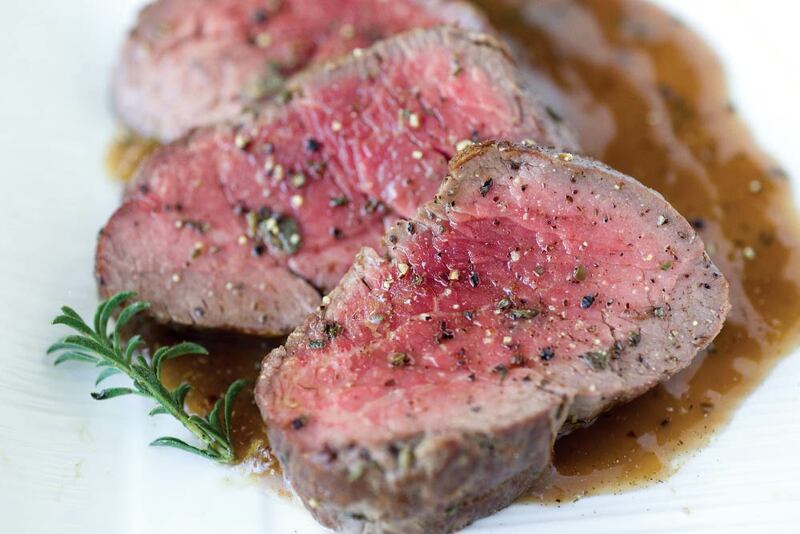 Our main course: rosemary-rubbed filet mignon (aka beef tenderloin), roasted to rosy perfection and served with a rich, garnet-hued Chianti wine glaze. 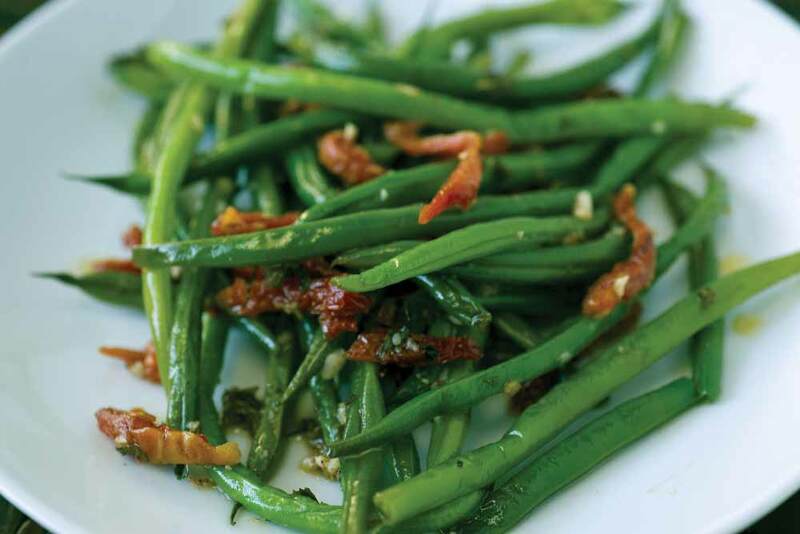 Roasted string beans make a fabulous summer side dish, and risotto is always impressive, especially when it's flavored with caramelized fennel and white wine as in my native city of Milan. 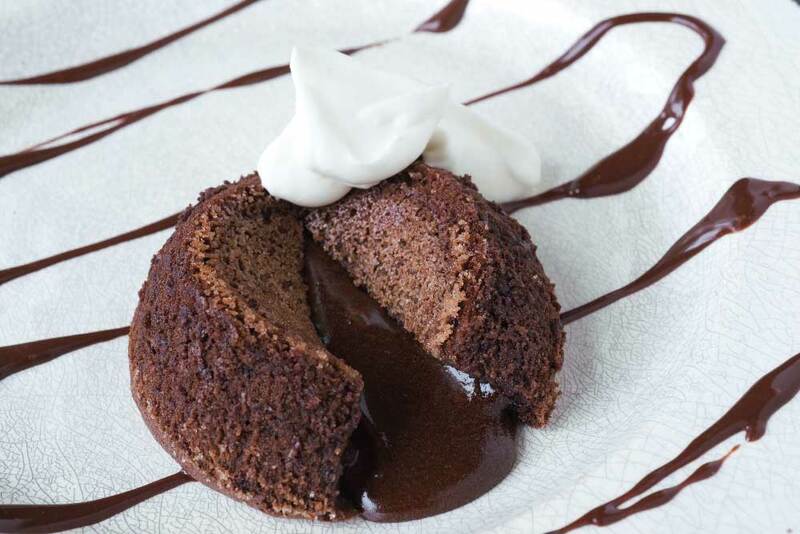 For dessert, we'll bake a decadently rich molten chocolate cake, a heavenly offering from northern Piedmont. 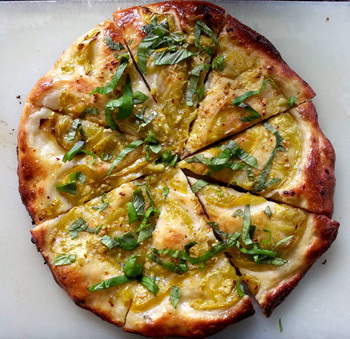 Best known around the world for its pizza and pasta, Naples' exuberant cuisine relies on sun-kissed vegetables and herbs, dried pasta, and fresh farmhouse cheeses (chief among them water buffalo's Mozzarella). 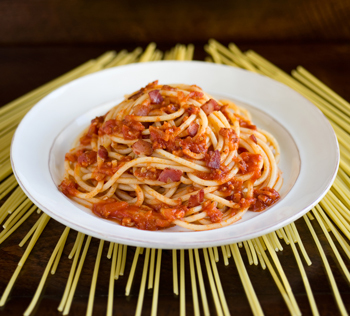 In the nineteenth century, people living in the capital city of Naples were nicknamed Mangia Maccheroni (Maccheroni Eaters); to this day, Neapolitans remain devout pasta eaters, and their pasta is among the best and the most varied in all of Italy. Join me for a taste of Naples right here in Manhattan, a chance to explore the cuisine of this lively southern Italian city without getting on a plane. We'll begin our Neapolitan feast with a timeless classic: handmade flatbread filled fresh tomatoes, Mozzarella, Prosciutto, and olives, the perfect starting point for any Italian meal. 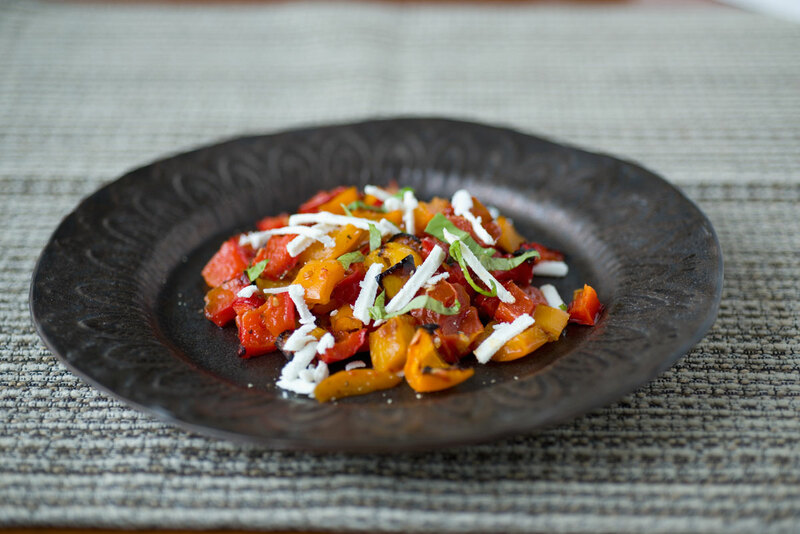 Next up: fresh pasta tossed with roasted summer peppers, tomatoes, and Ricotta Salata. 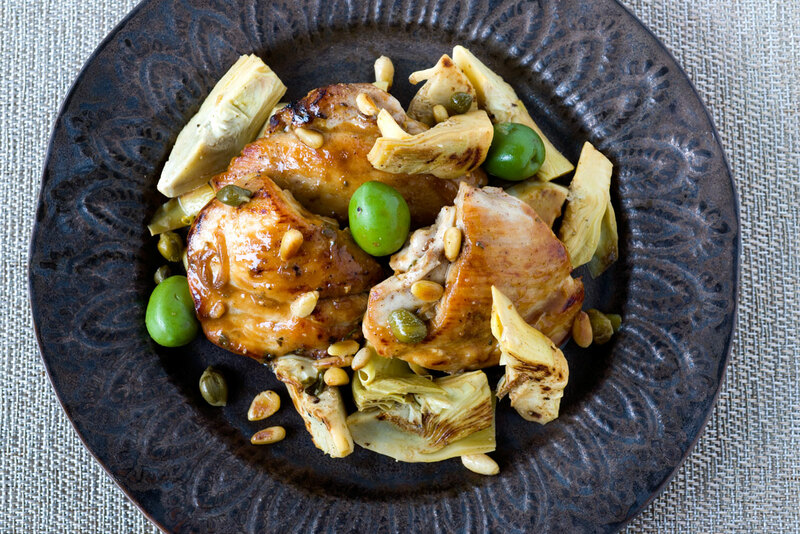 Our main course: chicken braised with capers, lemon, white wine, and garlic, just delicious with a side of stuffed eggplant bundles. 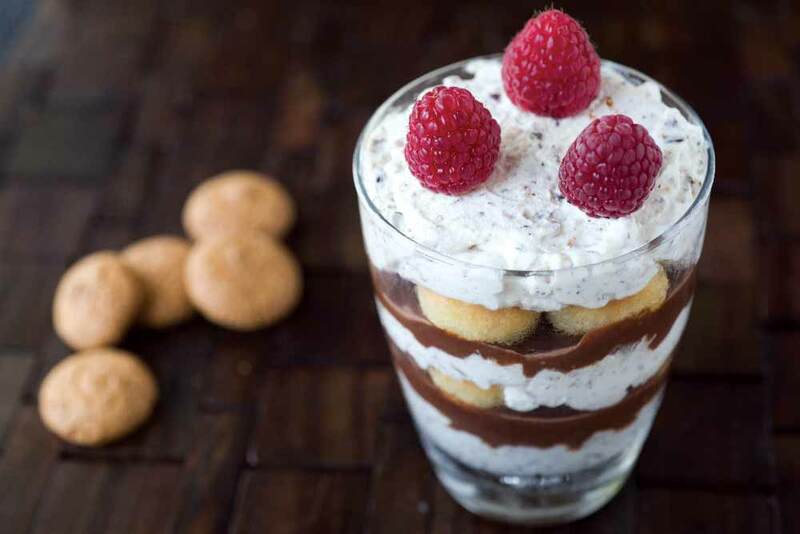 A classic Neapolitan dessert featuring liqueur-soaked ladyfingers and a silky espresso custard closes the meal on a decadent sweet note. 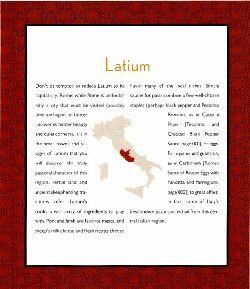 This light yet elegant summer menu takes its inspiration from the northern regions of Piedmont and Emilia-Romagna. 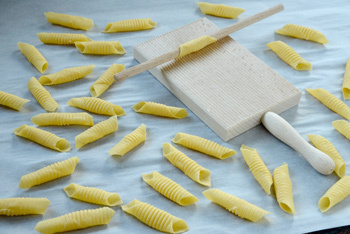 We'll begin our northen Italian feast by making garganelli pasta, a specialty of Romagna that is the ancestor of penne rigate; we'll roll squares of fresh pasta around a small wooden pin on a grooved board to create a quill-shaped pasta and sauce our garganelli with a fresh tomato sauce studded with peas and enriched by just a splash of cream. 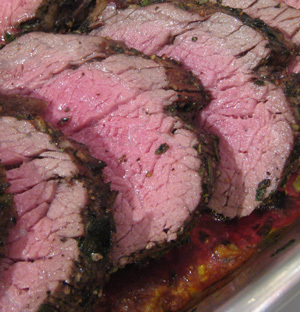 As a main course, we'll roast a beef tenderloin and serve it with a refreshing parsley and garlic pesto known as salsa verde; a side of roasted summer vegetables and my favorite stuffed tomatoes are ideal accompaniments. 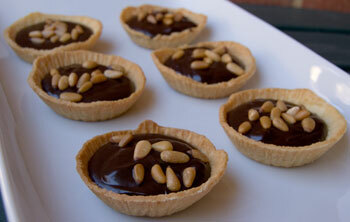 And for dessert, we'll bake rich chocolate-filled tartlets, so good with a glass of fred wine! 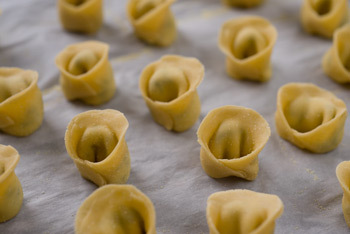 Although we designed this class with beginner cooks in mind, the techniques we'll be covering are so basic and so important to Italian cooking that anyone who enjoys Italian cuisine is sure to learn something new. 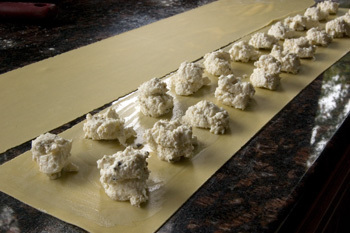 We'll start off by making fresh egg pasta; I have devised a special formula that is foolproof and yields consistently delicious results, no matter what shape of pasta you're craving... it's all about which flour you use and how many eggs you add to your dough. 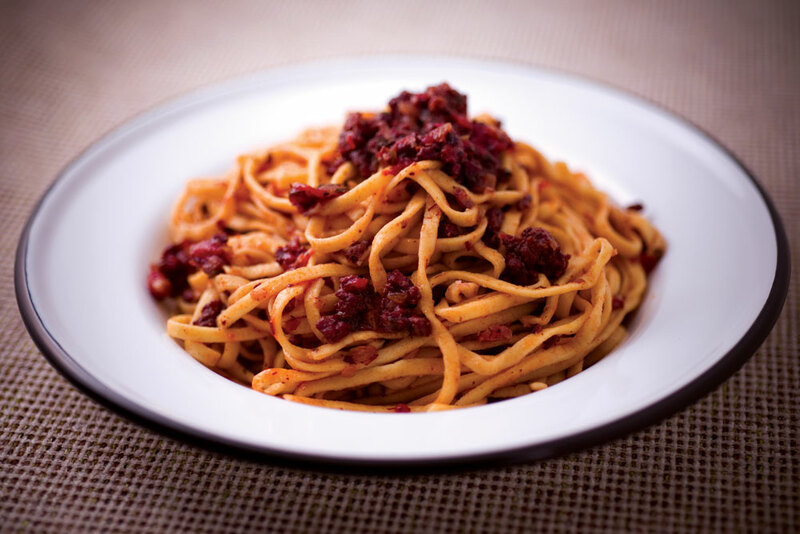 We'll cook a perfect ragu sauce for our pasta, and there's a key to success here too, one that many advanced home cooks often skip, with disappointing results. 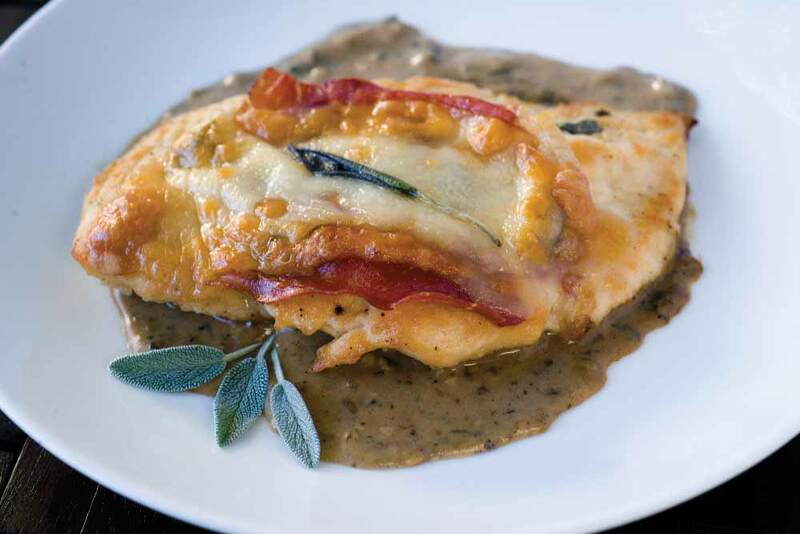 As a main course, we'll brown chicken scaloppine, top them with cheese and Prosciutto, and finish them in the oven as we create a flavorful pan sauce with Marsala wine. 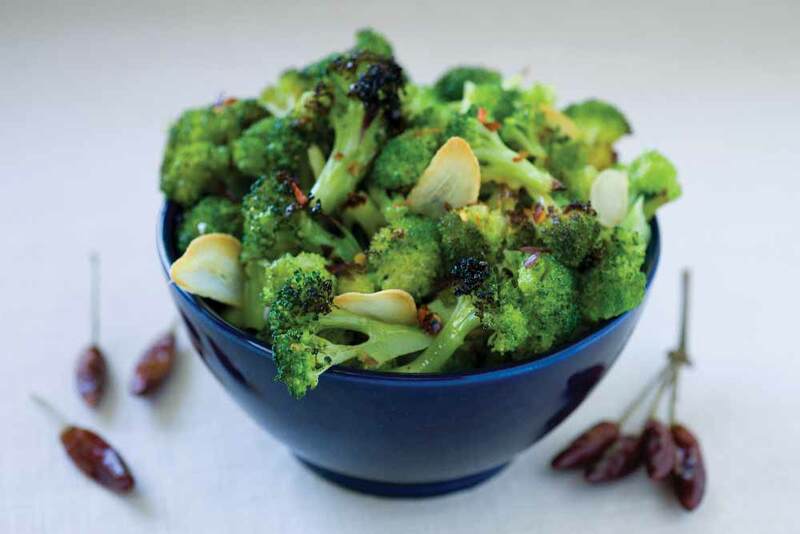 Broccoli is first blanched, then roasted with garlic and chili to make a refreshing accompaniment for the chicken; sweet red baby potatoes are roasted until they are crispy on the outside and creamy within, then showered with fresh chives and a hint of smoked paprika (these potatoes are so ridiculously good that we promise you'll be making them time and again!). 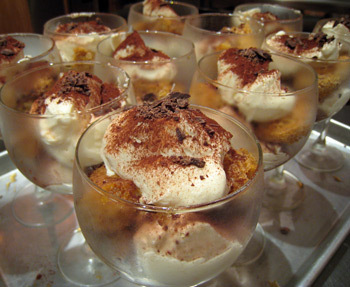 And for dessert, I'll share my foolproof recipe for tiramisu with you... it's so good, you'll never be able to eat the store-bought stuff again. My family has had a home in Piedmont, overlooking the Lago Maggiore, since I could barely talk. 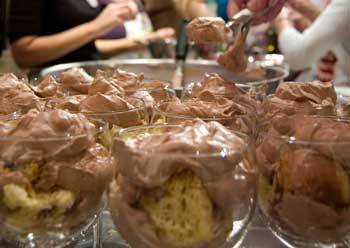 I grew up on the rich roasts, buttery pastas, creamy risottos, and cheese-laced polentas of the area; not to mention its famed chocolate desserts, sweetwater fish, and delectable farmhouse cheeses. 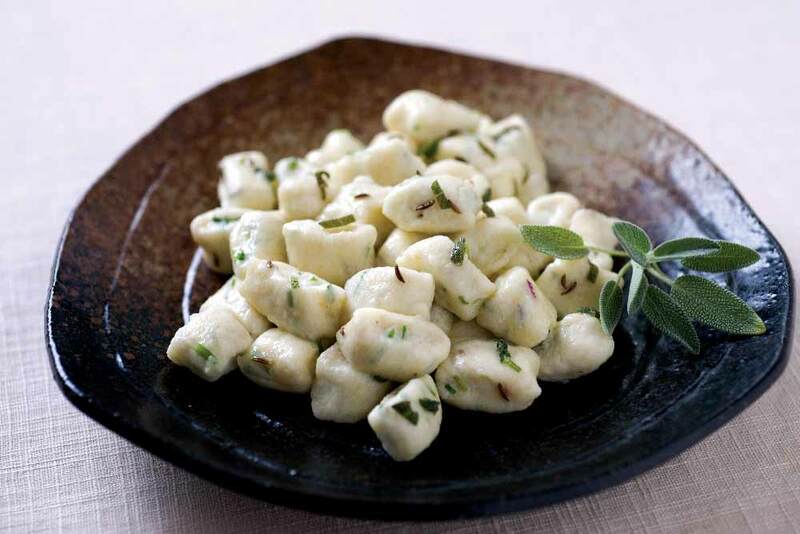 This class explores Piedmontese cooking in all its glory, from its delectable gnocchi all the way to its memorable desserts. 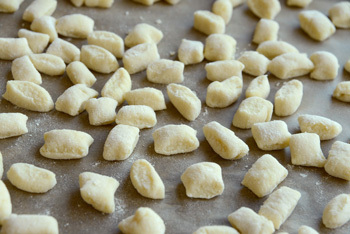 We'll begin by making the dough for gnocchi; while potato gnocchi may be the ones you think of first, yams, pumpkin, squash, and even sweet potatoes make the perfect starting point for gnocchi: as long as you handle the dough right and follow my foolproof proportions, you'll have the lightest gnocchi imaginable. 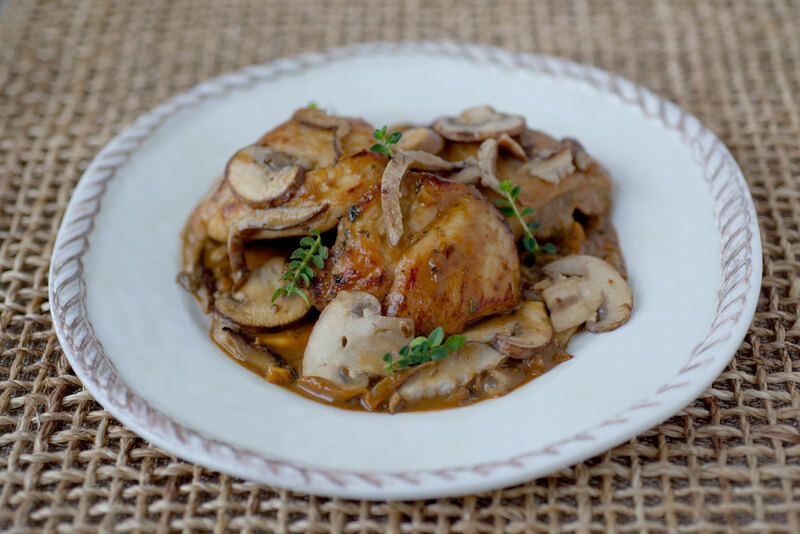 As a main course, we'll braise tender chicken morsels in a rich sauce with wild mushrooms, rosemary, and white wine, three of Piedmont's signature ingredients. 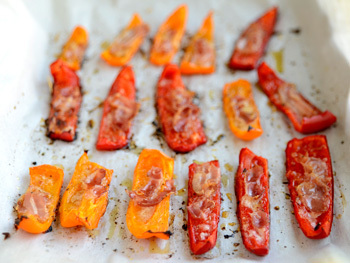 A side of roasted summer peppers and crispy polenta fries are my favorite accompaniments. 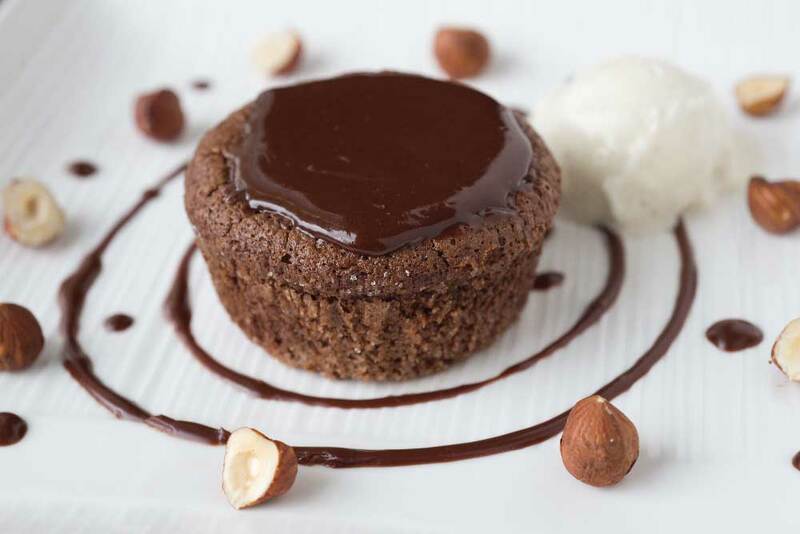 And for dessert, we'll bake a flourless, rich, not-too-sweet hazelnut chocolate cake; after all, Piedmont is renowned the world over for its chocolate and its hazelnuts. Take a trip in any Italian region, and you'll often find that the best food is found in the informal restaurants known as trattorie. 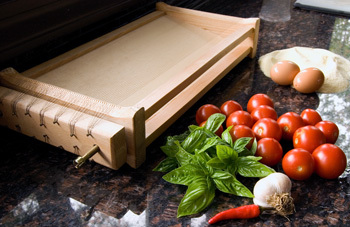 Fresh ingredients and simple preparations are the building blocks of trattoria cooking, and this class pays homage to some of my favorite trattoria dishes from across Italy. 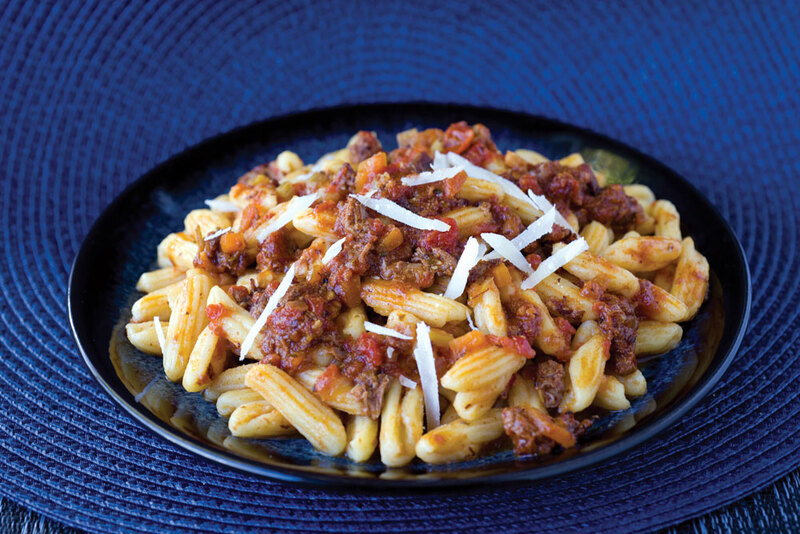 Our first course: handmade cavatelli pasta sauced with a red wine-laced ragu; this is the sort of sauce simmers for hours until it develops a sublime flavor and succulent texture, and it's one you'll surely make time and again once you see how easy it is to prepare at home. Our main course: tender filet mignon medallions napped in a rich red wine reduction, served with Ricotta-stuffed tomatoes and a sage-scented mushroom bread pudding. 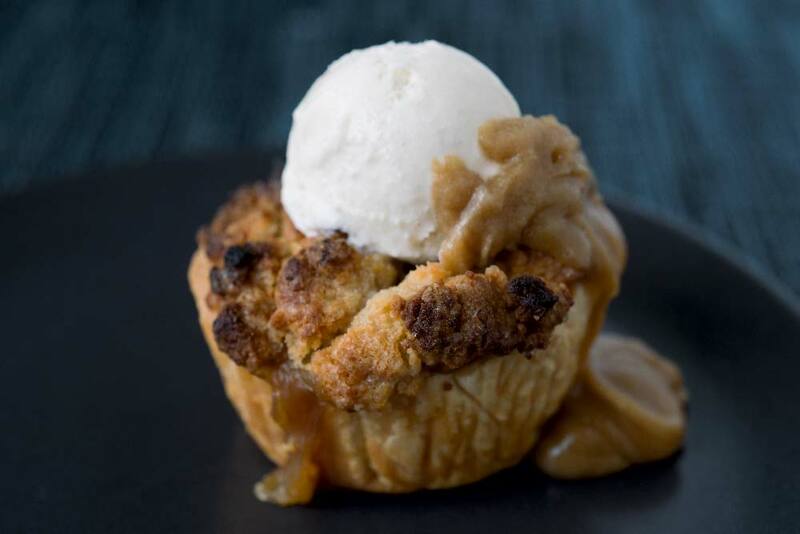 For dessert, we'll bake a moist apple cake with the haunting aroma of amaretto, perfect with a tuft of freshly whipped cream. 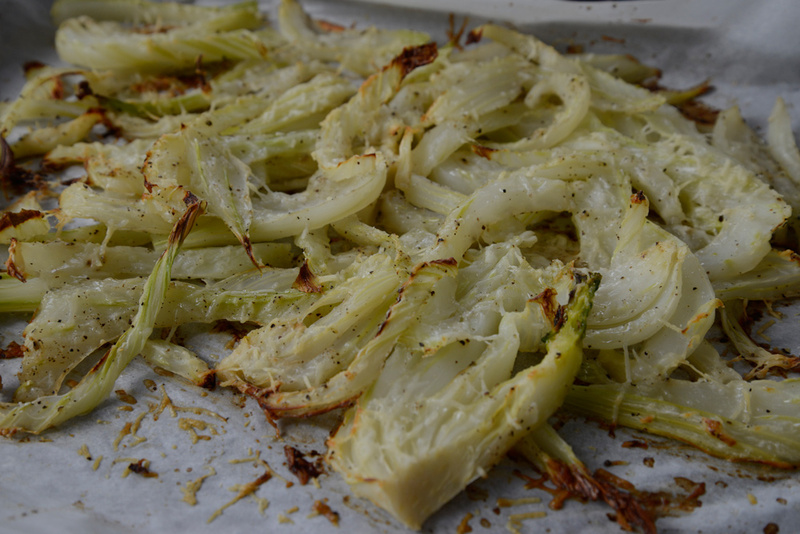 I was born in Lombardy, and my family still has homes in Piedmont and Liguria, so I grew up on the cooking of these three Northern Italian regions. 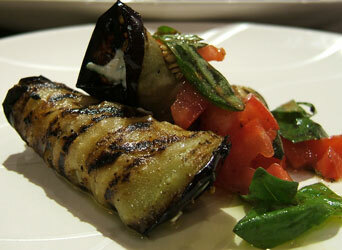 Join me for a new class that delves into the unique cuisines of this amazing part of Italy. 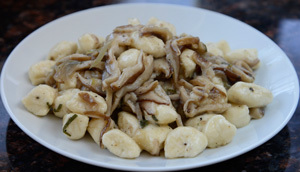 We'll begin by making one of Liguria's most emblematic pastas: delicate, hand-made potato gnocchi, served in a heady, herb-kissed mushroom sauce. 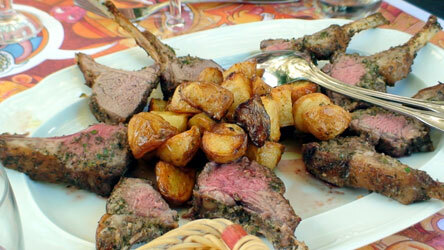 Next, we'll marinate baby lamb chops and roast them to create a sumptuous main course. 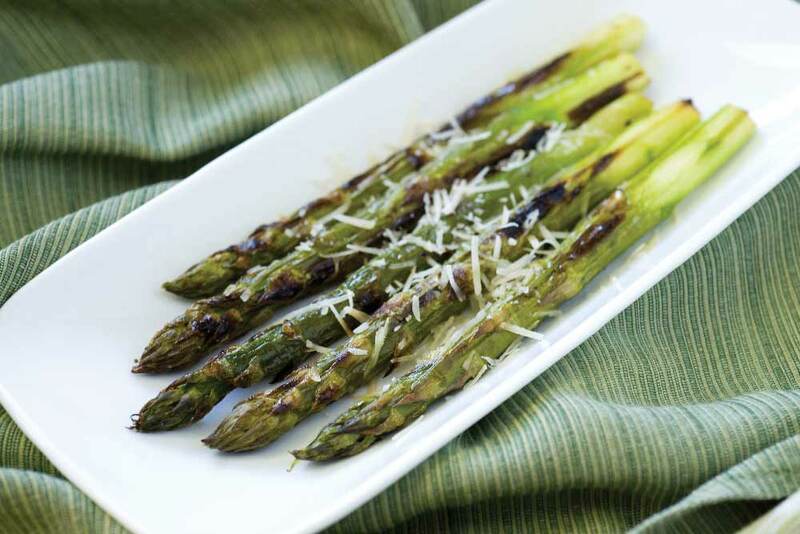 We'll bundle tender asparagus spears with a slice of smoked Mozzarella and Prosciutto and roast them until the cheese melts; herbed baby potatoes are a perfect side for our main course. 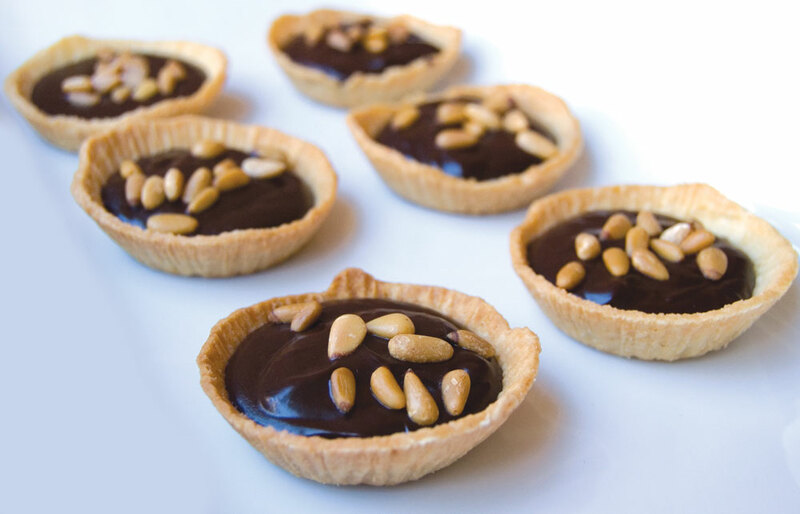 And for dessert, we'll bake buttery tarlets filled with a deep, dark chocolate ganache. 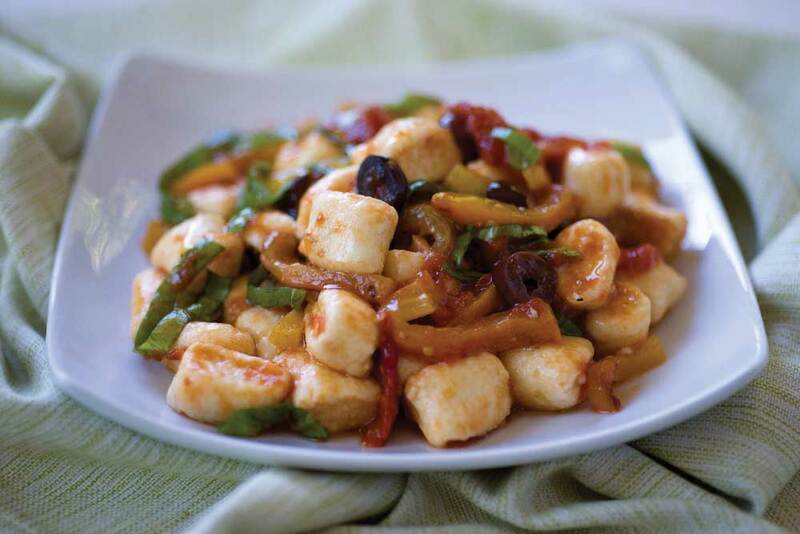 Italy's three most famous cities are also home to some fabulous home cooking... Florence, Venice, and Rome each boast a delectable cuisine steeped in centuries of tradition and local pride. 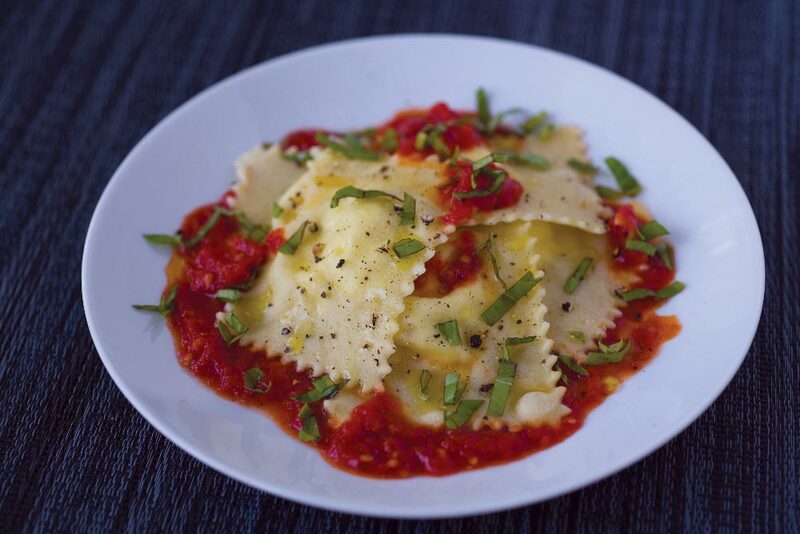 Our menu begins with a rich, satisfying handmade ravioli from Tuscany, tossed with a summery tomato sauce and plenty of arugula. The main course is a favorite from Tuscany: morsels of boneless chicken with artichokes, wine, and herbs, served with a feather-light spinach and Parmigiano souffle' (yes, it's all about those beaten egg whites!!) 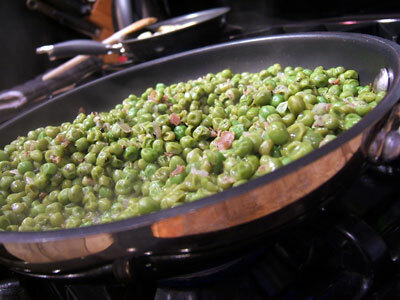 and a luscious herb-laced risotto. 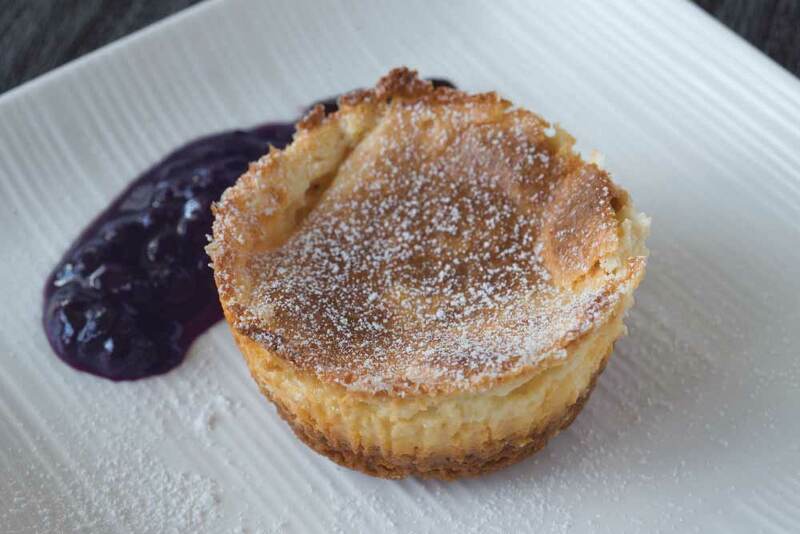 We'll finish up with Rome's justly famous cheesecake, as light and creamy as it is easy to make. 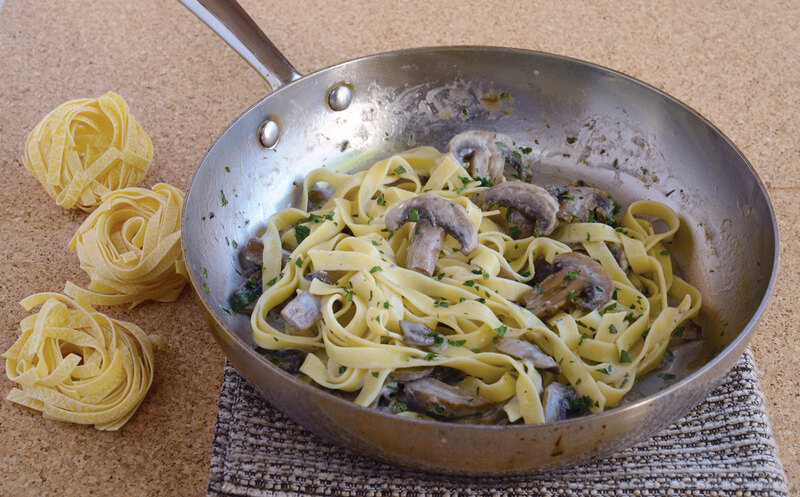 With this menu, you won't need to hop on a plane this fall to feel like you've been transported to Italy! 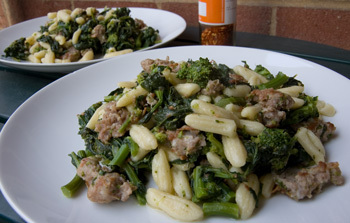 Get ready for an unbelievable taste of Tuscan food... Light, yet full of flavor, this menu will transport you to the Tuscan countryside on first bite. 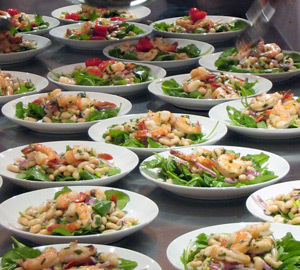 Our starter: an elegant marriage of herb-marinated shrimp, creamy cannellini beans, and peppery arugula spiked with olives and lemon zest; this salad is so delicious, in fact, you'll find yourself making it time and again for guests on lazy summer days. Our main course: tender morsels of chicken braised with tomatoes and white wine, perfect with a side of pillowy Ricotta gnocchi and some roasted summer vegetables. 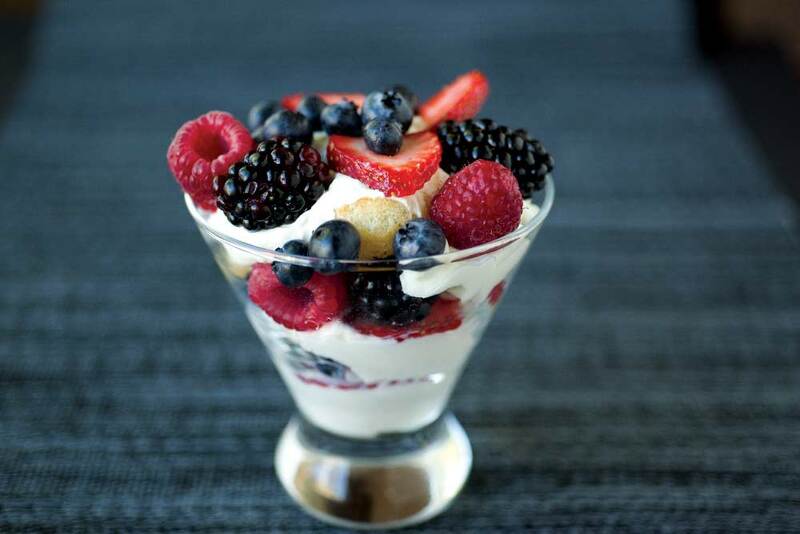 For dessert, we'll whip up an addictive mousse of Mascarpone and Limoncello, topped with fresh summer berries. 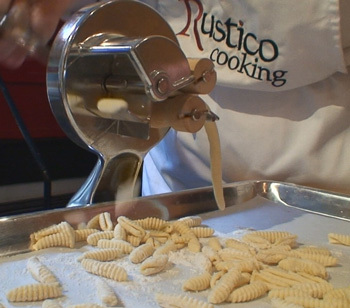 RUSTICO COOKING is located at 40 West 39th Street, Third floor, New York, NY 10018 - right between Fifth and Sixth Avenues, in the heart of Midtown Manhattan. When you get to the building, just press on buzzer # 3. Visits are by appointment only. WHEN: Daytime lunch classes begin at 12 PM, (doors open at 11:45 AM) and Evening Dinner classes start at 6 PM (doors open at 5:45PM). Classes last 2.5 to 3 hours. GETTING THERE: You can take the 4, 5, or 6 trains to Grand Central, or the F or V trains to Bryant Park-42nd Street. If you prefer the bus, take the M1, M2, M3, or M4 along Fifth and Madison Avenues, or the M6 and M7 along Sixth and Seventh Avenues. If you are coming by car, park at one of many parking lots in Midtown. 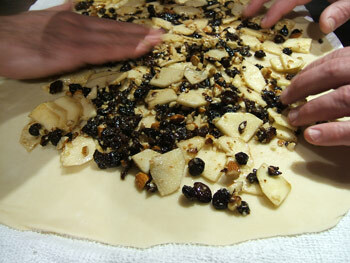 WHAT TO BRING: We supply all ingredients, tools, and, of course, recipes... Aprons are the only item NOT supplied. You can bring an apron if you like, or you can purchase a handsome embroidered apron for $20. WHAT TO EXPECT: Class size averages 16 people. Before the class starts, finger foods and water will be available for the class participants. The instructor will give a brief introduction about the class, then participants will wash their hands and people with long hair will tie their hair back (we are extremely hygiene conscious since you will be eating the food that you are preparing!). Then everybody goes in the kitchen for the cooking portion (details on that below) which lasts about 90 minutes; At the end of the cooking, people are seated and the featured menu is served along with a taste of 2 to 3 wines. 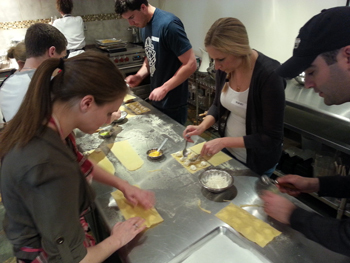 COOKING CLASS FLOW: Classes are hands-on: participants will make everything on the menu, working together as a group. 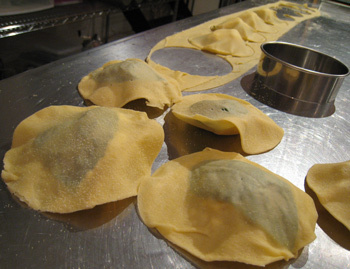 To ensure everyone learn the most important parts of a given menu, key techniques (such as making fresh pasta dough from scratch for instance) will be executed by class participants individually or in small teams of 2-3 people. 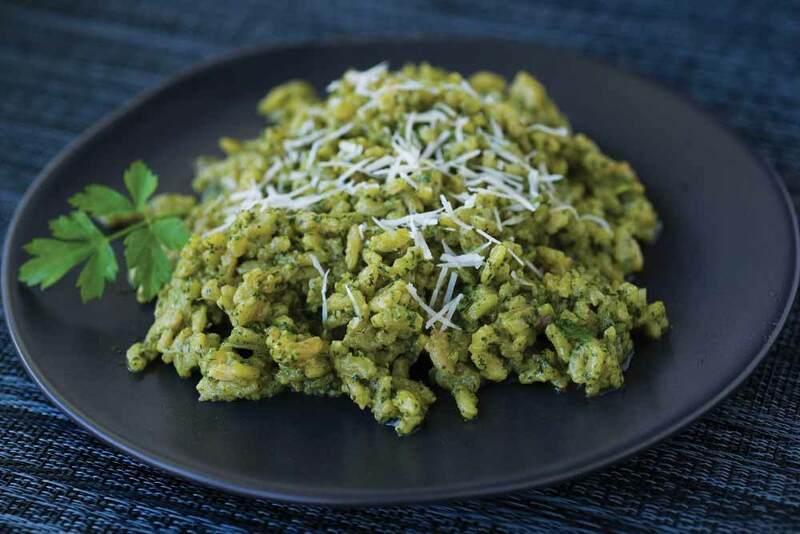 Other parts of the menu may involve larger teams where individuals take turns in an activity; for instance, when making risotto in a class of 16 people, it would be impossible to have 16 risotto pans at the stove, so we would have 2 pans, and participants will take turns stirring. 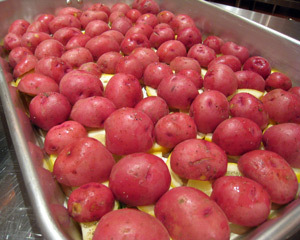 In order to allow class participants to spend more time focusing on the relevant techniques of a given class, washing, measuring and chopping of the majority of ingredients is done before students arrive. This way, class participants can spend a longer time mastering the trickier aspects of Italian cooking; we feel that people can more easily figure out how to measure ingredients and how to get from an onion to a chopped onion, compared to knowing the technique to make (for example) amazing gnocchi every single time - so we spend more time on these more challenging techniques. WHAT TO WEAR: Flat shoes and comfortable clothing are required for your safety and comfort. Please avoid high heels and loose sleeves. ONLINE PAYMENT: The easiest way to reserve a class is to pay online using the "Add to cart" buttons (quick, easy, & secure). Within 24 hrs you will get a reservation confirmation via email; we will ask for a phone number - Please note that the telephone numbers are not used for solicitation or marketing, they are only for reaching clients in the unlikely event that a class that they have signed up for needs to be rescheduled. PAYMENT BY PHONE: You can also call 917-602-1519 and we will take a reservation. We accept VISA, MasterCard and Discover. REDEEMING A GIFT CERTIFICATE: The easiest way is to use our online form under each class description; just fill up the required information and we will sign you up for the class of your choice unless it is sold out! You can also email us indicating the class(es) that you want to join, and the name of the person that gave you the certificate(s). We will then email you back with a reservation confirmation. You can also call 917-602-1519 in order to redeem your gift certificates. PAYMENT BY CHECK: You can also send a check payable to RUSTICO COOKING LLC to: RUSTICO COOKING, 40 West 39th Street, 3rd floor, New York, NY, 10018. Please include a note with your name, telephone number, email address, and date of the class with your check. If you have made a check payment, please call 917-602-1519 to confirm your reservation 3 days before class. To sign up or for further information, call 917-602-1519. To purchase a gift certificate package, click here or call 917-602-1519. CANCELLATION POLICY: No refunds issued, only credit. 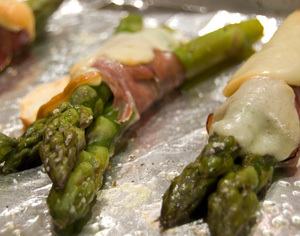 For regularly priced cooking classes: minimum 7-day advance notice. 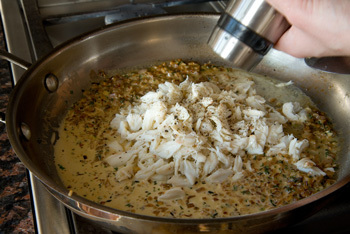 For cooking classes priced at more than $110 per person: 14-day advance notice. For groups of 4 or more: 21-day advance notice.